Note: The Dean Surname Y-DNA Project at https://www.familytreedna.com/groups/dean/dna-results, administered from 2003 to 2018 by Larry Dean of Vancouver, Washington, U.S.A., examined connections between groups of Deans in the U.S. and Canada. He located three known male-line descendants, through three different sons, of our ancestor John Dean (1754-1827), who appear in his results with FamilyTreeDNA kit numbers 29604, 430181, and 357498. All belong to the R1b1a2 haplogroup. In his analysis, Larry writes: “Based on their pedigree information, [these] subjects … are descended from John Dean who emigrated from New Jersey to Canada. The 33/37 match between [two of the] subjects … does meet FTDNA’s criteria for a match, but their four mismatches are more than one might expect for a common ancestor only four or five generations back.” The two closest matches with known English origins … both come from Yorkshire. Another participant in the study (FTDNA kit no. 107127) is a close genetic match to the John Dean descendant, but on chronological grounds is probably not directly descended from John Dean. Based on information provided by Larry Dean and by the family of the new test-subject, we have started a web page entitled A second Dean line to assist in the exploration of this lineage. Our original point of departure in compiling these notes was Cecelia and Roland Botting’s The Deans of Gainsboro Township (hereafter DGT), a booklet of 34 pages which they published some time in the early- to mid-1970s. The present notes incorporate much of this work (including all of the male lines), but do not entirely supersede it. The Bottings clearly had access to the bible record which we reproduce at the end of these notes, as well as other family papers which we have been unable to identify. Unfortunately, our acquaintance with the Bottings began near the end of their lives, leaving insufficient opportunity for obtaining clarification from them of some points of doubt in their work. The copy of DGT owned by the Niagara Branch of the Ontario Genealogical Society contains a number of valuable handwritten annotations which we believe to be by the local historian Corlene Taylor. We have incorporated many of these comments and suggestions below. The first edition of R. Janet Powell’s Annals of the Forty: Loyalist and Pioneer Families of West Lincoln, 1783-1833, 10 vols. (Grimsby, 1950-59), 4:46-9, has a rather weak account of this Dean family, which although improved somewhat in the second edition (19__), 4:54-7, treats mainly of the family of John Dean, Jr., a son of the Lincoln County settlers, rather than the first immigrant generation. This would appear to have been the main, if not only, source, of the brief account of the Dean family in pp. 131-32 of Eugene A. Singer & John Singer, A Singer family of colonial Vermont and Canada, including the Overholt, Staats, Hunsberger, Slough, Will, Hertzel, Terryberry, Dufford, Swackhammer, Snyder, Freas, Moore, Flock, Dean, Boddecker and Dooley families, 3rd ed. (Lahaina, Hawaii: privately published, 2001). Lisa J. Schureman, who provided an account of the family of Enos Dean and Diana Cooper. Sally Wadley, a descendant of Lydia Dean and Charles High. Debbie Dean, daughter of Earl Rodney Dean. 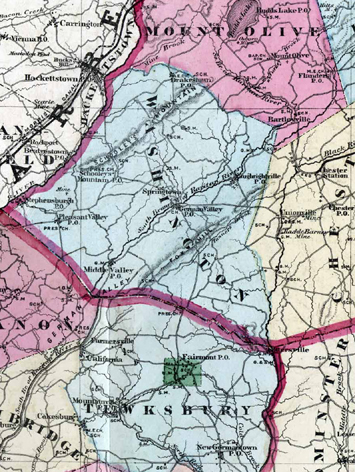 Left: The border region between Morris and Hunterdon counties, showing many of the places mentioned in these notes, including German Valley and Fox Hill, in the part of Washington Tp. 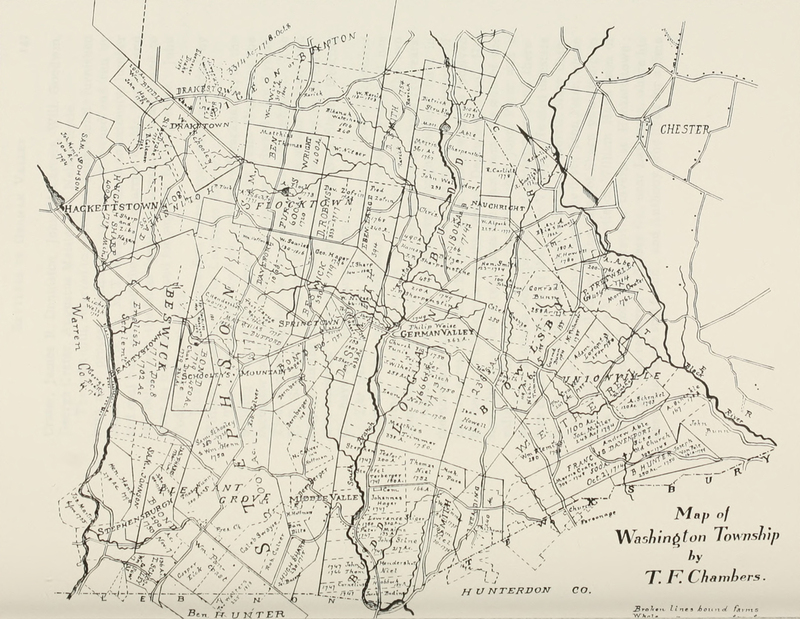 set off from Roxbury Tp., and New Germantown (now Oldwick), Tewksbury Tp., Hunterdon Co.
Left: The 112-acre property of John Dean near Fox Hill and Flocktown, purchased from Conrad Bunn in 1783, in the part of Roxbury Tp. later set off as Washington Tp. in 1798; detail from the map facing p. 146 in Chambers’s Early Germans of New Jersey, rotated so that north faces upward. 1. John Dean, of Gainsborough Tp., Lincoln Co., Upper Canada (now Ontario), is said to have been born 1 March 1754, died 19 September 1827, and was buried in St. Anns Presbyterian churchyard, Gainsborough Tp. As “John Deane” he married 29 March 1781, in the Zion Evangelical Lutheran Church, New Germantown (now Oldwick), Tewksbury Tp., Hunterdon Co., New Jersey, Margaret Flach, born ca. 17 March 1752, died 6 March 1839, “aged 86 years, 11 months, 19 days” (per her gravestone), and buried with her husband in St. Anns Presbyterian churchyard, daughter of Andreas Flach, of Flocktown, German Valley (now Long Valley), Roxbury Tp. (in the portion subsquently set off as Washington Tp. ), Morris Co., N.J., by the latter’s wife Anna Maria Schütterlin. As to the question of where John Dean was before his marriage in New Jersey in 1781, we have found no clue, and unfortunately the New Jersey census returns for 1790 and 1800 are both lost. Considering the date of his birth, one would expect that John Dean would have served in the Revolutionary War; and it is possible he was the Private John Dean who served in Captain Albert Opdycke’s Company of the Second Regiment of Hunterdon County militia (the county in which our subject was married), and also in the State Troops. As he is said by family tradition to have come from Fox Hill, in Roxbury (now Washington) Tp. aforesaid, when he brought his family to Canada in July 1801, there is no reason to doubt that this man was the John Dean who in 1783 bought 112 acres of land between Fox Hill and what is now Naughrightville, and sold them to Andrew Shangle in 1801. 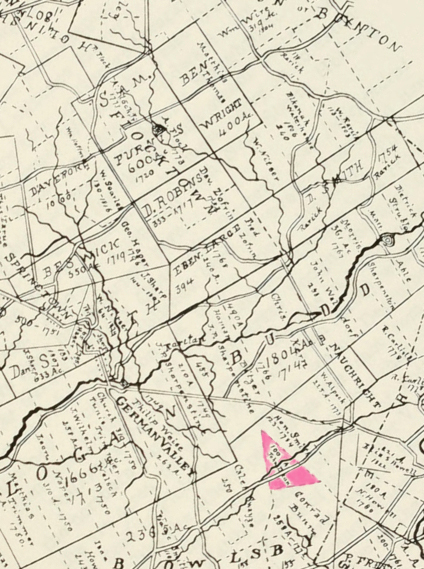 The lot, which can be seen on the map facing p. 146 of Chambers’s Early Germans of New Jersey, was only a short distance south-by-southeast of Flocktown. The original deed of this sale, dated 13 May 1783, for the land and premises, which were purchased of a Conrad Bunn and his wife Mary for £150, gives a very detailed description of the tract, near Tanner’s Brook, but merely describes John Dean as of Roxbury Tp., without mentioning his occupation, and contains no signature or mark from him. A rate taken the following year reveals this John Dean as one of the more substantial freeholders in Roxbury Tp., being assessed 10s. 9d. on 200 acres of “improved land,” with 3 horses and 2 cattle. This man’s household then consisted of 3 whites and no slaves, and this information, so far as it goes, is consistent with our supposition that he was identical with our John Dean, whose first child was born in 1782 and whose second was not born until September of 1784. He is presumably also the John Dean of Roxbury Tp. whose name appears in the 1793 list of Morris County freeholders, and in the list of Morris County militia made in the same year. John Dean of Roxbury Tp. must, however, be distinguished from a closely contemporary John Dean, who baptized five children in the First Presbyterian Church, Morristown, Morris Tp., Morris Co., on 23 October 1782; for the birthdates of the latter’s children range between 1772 and 1781, overlapping with those of our John Dean. Other Deans are also found in the Morristown area in the late eighteenth century, but we have not found sufficient data to form a connected pedigree. John Dean (presumed to be the one of Roxbury Tp.) settled with his family on lot 26, conc. 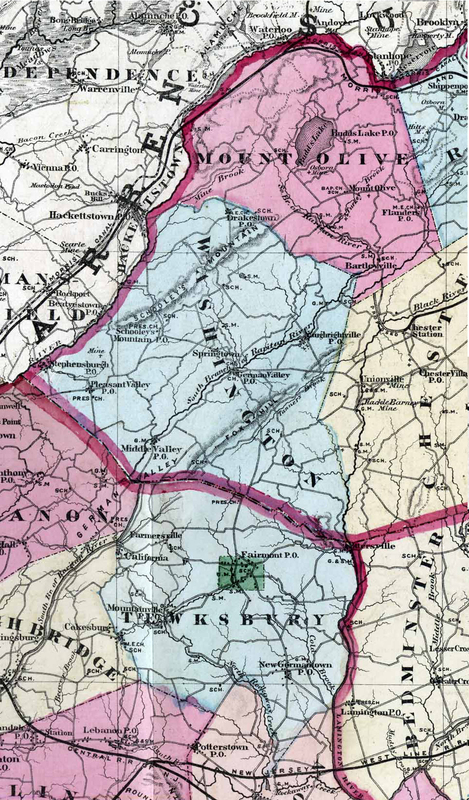 6, of Gainsborough Tp., Upper Canada, which later became part of Lincoln Co. The date of their arrival is traditionally given as July of 1801, which is in pretty good agreement with the entries in the 1842 census for their sons Philip and Andrew, giving their periods of residence in the province as 42 and 41 years, respectively. “John Deen Senr.” is listed on concession 6, lot 26 of Gainsborough Tp. in the 1812 voters’ list of Lincoln County. Other contemporary Deans are found in the vicinity of Gainsborough, but there is no clear evidence of any relationship to them. We do know, however, that Margaret (Flach) Dean had been preceeded to Canada by her sister, Christina Flach, wife of Andrew Hansel (or Hansler), who had come to Thorold Township by 1799. The name of “Margaret Dean, widow” appears in an 1833 list of the members of Gainsborough Presbyterian Church. Mary Dean, born 30 January 1782, died 18 March 1864. She married by 1803, Henry Snyder, born 12 March 1778, died 2 May 1850 [or 1849? ], son of Adam Snyder, of St. Anns, by the latter’s wife Ann Freas. They settled on lot 18, conc. 6 of Gainsborough. DGT lists eleven children for them. Of these, Margaret Snyder (1815-1896), wife of Ephraim Singer (1814-1867), was the great-grandmother of A. Singer (1921-), one of the co-authors of the Singer genealogy cited above. 2John Dean, Jr., born 11 September 1784. 3Philip Dean (twin), born 17 April 1787. Elizabeth Dean (twin), born 17 April 1787, died 1872, and buried in St. Anns Presbyterian churchyard. She married 19 June 1803 (by Robert Nelles, J.P. for Niagara), her sister Mary’s husband’s brother, Joseph Snyder, of Gainsborough Tp., born 24 December 1780, died 1866, son of Adam Snyder, of St. Anns, aforesaid, by the latter’s wife Ann Freas. Annals of the Forty, 8:63, lists three children for them. Barbara Dean, born 16 June 1791 at Fox Hill, died 27 June 1864, and buried in St. Anns Presbyterian churchyard. She married 11 February 1816, John Kennedy (III), born 4 March 1787 in New Jersey, died 18 April 1874, and buried in St. Anns Presbyterian churchyard, son of John Kennedy (Jr.) by the latter’s wife Charity Wurts (see our forthcoming KENNEDY page). They were direct ancestors of the present writer. 4David Dean, born 22 May 1793. 5 Andrew Dean (named for his maternal grandfather), born 20 July 1796. John Dean’s assessements were consistently amongst the three highest in the township. John Dean was himself an assessor in 1832 and 1833. Between 1834 and 1839 (there were no censuses taken between those years) John Dean divested himself of some of his land: the 200 acres of lot 21 in the 2nd concession to his son Thomas A. Dean, and the 100 acres of lot 11w in the 10th concession to his son John. The 1839 census-assessement, listing John Dean “Sr.,” as he is now called, gives his family’ religion as Church of Scotland. The 1840 census entry purporting to be for John Dean Jr. presents a family composition completely incompatible with that given for the son in 1839, and is probably as mistake for the missing household of the father. The 1840 census lists a James Dean, unknown to DGT, in the immediate vicinity of John Dean, and it is possible that this man was an otherwise unknown son of the latter. Matilda (or Mahala?) Dean, born 12 February 1807. She married 22 March 1826, Jackson Ismond, and had issue. In 1830 he held 16 cultivated acres and 84 uncultivated acres in the 9th concession of Erin Tp., Wellington Co., and had a household consisting of 1 male over 16, 1 female over 16, no males under 16, and 1 female under 16. Two years later, he is listed in the 1832 assessment of the same township at lot 12 East, concession 9 of Erin Tp., Wellington Co., this time with a household consisting of 1 male over 16, 1 female over 16, no males under 16, and 2 females under 16. We have not located this couple in the LDS index to the 1881 census. Wellington Shingler, born 1844-45 (aged 36 in 1881); still living unmarried with his parents in 1881. 6Thomas Allen Dean, born 16 February 1811. Hannah J. Dean, born 1851-52 (aged 19 in 1871), still living unmarried with her parents in 1871. Mary Dean, born 22 February 1815, not found in 1881 census. She married 14 March 1837, John Havens, born ca. 14 December 1815, died 7 September 1858, “aged 42 years, 8 months, 23 days,” who seems to have been a son of William Havens, Jr., of Grantham and Clinton townships, by the latter’s wife Elizabeth Schram. He may have been the John Havens who settled on lot 2, concession 7 of Caistor Tp., Lincoln Co. Their daughter, Sarah Catherine Havens, born ca. 11 September 1841, died 22 December 1861, “aged 20 years, 3 months, 11 days,” wife of ____ Yemen, is mentioned in the Dean family bible. Israel Dean, born 1 August 1817, died 15 June 1818. Sarah Anne Hilts, born 1838-39 (aged 13 in 1852), died 1893; married 12 October 1858 in Elgin Co., Nelson G. Campell. Mary Anne Hilts, born 1840-41 (aged 11 in 1852), died 1863; married 1 August 1863 in Elgin Co., John McKinney. Her surname is given as “Hiltz” in her marriage record. Eliza Jane Hilts, born 1842-43 (aged 9 in 1852), died 1863; married 9 August 1863 in Elgin Co., Alvin C. Moss. Charlotte Hilts, born 1844-45 (aged 7 in 1852); no marriage shown in Durham genealogy. Matilda Catherine Hilts, born 1847-48 (aged 4 in 1852), died 1893; married 26 December 1867 in Elgin Co., Thomas J. Sutherland. In the Fall of 1869 he went to Wisconsin. He received local preachers’ license from the District Conference of Eau Claire, West Wisconsin Conference of the M. E. Church, August 20, 1879. In the Fall of 1883 he was appointed pastor of the Eau Claire Circuit by the P. E. for one year. In 1884 he united with the West Wisconsin Conference, on trial, and was appointed to Modena charge. At the session of his conference at Black River Falls, Oct. 3, 1886, he was ordained deacon and received into full connection in the conference, and appointed to Knapp's charge. October 7, 1888, he was ordained elder and stationed at Mandori, Buffalo county. Wis. Sept. 15, 1889, he was transferred to the Michigan Conference and stationed at Grandville, Kent county, Mich., and served at other appointments up to the time of his death. Frederick E. Yokom, born 24 December 1879. Priscilla Hilts, born ca. 1854; no marriage shown in Durham genealogy. James M. Hilts, born ca. 1859; no marriage shown in Durham genealogy. Ann Eliza Dean, born 12 March 1822, died 15 October 1861. She married 25 September 1842, Robert Kirby. If she was widowed by 1852, she may account for the Eliza “Deane” (aged 30) and Almeda “Deane” (aged 3) found in her parents’ household in the census of that year. It is also possible that she and her husband had separated, as a Robert Kirby, aged 30, farmer, whose marital status is given as single, appears nearby in the 1852 census. Martha Catherine Dean, born 2 June 1824, died 1 May 1829. Andrew Dean, born 27 December 1826, probably living 1871. DGT does not show a marriage for him. He is presumably Andrew Dean was still living unmarried with his parents in 1852, when he was a laborer. Andrew Dean, unmarried, aged 44 years, is found in the 1871 census of Erin Tp., in which he is called a laborer, and is found as a lodger in the house of John Shingleton, a very close neighbor of John Dean (III) above. No Andrew Dean of the right age has been found in the LDS index to the 1881 census of Ontario. 7Ephraim Dean, born 11 August 1829, died 28 March 1862. Henry Dean, born 1857-58 (aged 3 in 1861), no longer living with his parents in 1881. Amanda Dean, born about 1859 (aged 1 in 1861, 27 in 1886) in Erin Tp. She is said to have married (1) ____ Calter. She married (2) 8 Dec 1886 in Clinton Tp., her probable kinsman, Robert Burwell Culp, born 1862-63 (aged 23 in 1886) in Rainham Tp., son of Isaac and Elizabeth (____) Culp. At the time of their marriage, the record of which names both sets of parents, both parties were resident in Clinton Tp., and he was a day-laborer; her name is given as Amanda Calter, widow, and the witnesses were Aaron Culp and James Dean, both of Clinton Tp. Dudley Dean, born 1869-70 (aged 11 in 1881). John Dean, born 1871-73 (aged 9 in 1881). Charles Dean, born 1875-76 (aged 5 in 1881). Irvine Dean, born 1879-80 (aged 1 in 1881). 3. Philip2 Dean, of Clinton Tp., son of John Dean and Margaret Flach, was born 17 April 1787 in New Jersey, died (testate) 1872. He married probably by 1813, Catherine Book, born 21 August 1791 in the U.S., died 29 December 1870, and buried on their farm, daughter of Conrad Book, of Grimsby, formerly of New Jersey, by his wife Ann Sophia ____. Philip Dean was a private in the 4th Regiment of Lincoln Co. Militia in May 1813. He later became a farmer, and purchased lots 12 in concessions 3 and 4 of Clinton Tp. As “Philip Deen” he is listed on concession 8, lot 3 of Grimsby Tp. in the 1816 voters’ list of Lincoln County. He is listed in the 1828 census of Gainsborough Tp., with a household (including himself) consisting of 3 males over 16, 1 female over 16, 3 males under, and 5 females under; thus he evidently had ten children at that time. He is also listed in the 1842 census of Clinton Tp., with a wife and family of ten children (not named), his farm of 150 acres being part of lot 12 in the 4th concession; he is stated to have been in the province 42 years. The 1852 census shows him and his wife with two of their children, Philip and Jane. His will, proved in 1872, has not been seen by us. DGT’s treatment of his family is in disagreement with the 1852 census, missing known children and attributing others to him who were born much too late to be his. A more plausible listing is supplied in Annals of the Forty, which is based on information furnished by a direct descendant, Mrs. Emily Book, of Beamsville; this says he had fifteen children, and lists eleven who survived infancy. The family burying ground, a corner of the farm on the rise of the hill east of Beamsville, known as the Quarry road, was transcribed in 1961, and the present compiler has a copy thereof in his possession. Margaret Dean, born 18 June 1812, and buried at St. Anns. She apparently married John W. Snyder, son of William Snyder, of Gainsborough Tp., by the latter’s wife Elizabeth Lindaberry. Buryl Franklin Dean born 1836; married Eliza Jane Dennis, died in 1922 at Wheatly, Ontario. They had issue. 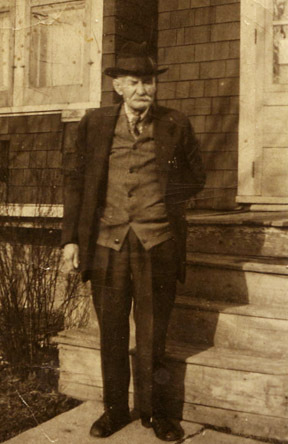 Hannibal Rathburn Dean, Sr., born 11 July 1837 in Caistor Tp., Lincoln Co., Ontario; married in 1861, Catherine Hewson/Houston, died 30 April 1924 in Vassar Tp., Tuscola Co., Michigan, daughter of John and Mary Phidora (____) Hewson. They had issue. Sulvan/Saul/Solomon Dean, born 1840; married Fanny Hewson, sister to the wife of his brother Hannibal. Harriet Sophia Dean, born 1842; married in 1861, John Allen, died 9 December 1882 in Tuscola Co. Michigan. They had issue. Purvis Enos Dean, born 1848; married Anna ____. Elizabeth/Ann Dean, born 25 November 1815. 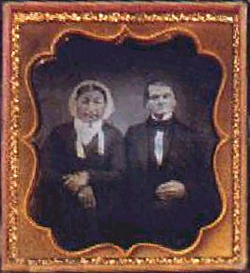 She married Joseph DeWitt, born 11 September 1842, died 12 October 1853, son of Jacob DeWitt, of Tapleytown, Saltfleet Tp. They lived on the west side of Quarry Road, Beamsville. Daniel Ward Eastman Dean, born 2 October 1817, living 1876. He was named after the Rev. D.W. Eastman, a minister of the church of Scotland, who came to Upper Canada from the Presbytery of Morristown, N.J., in 1801, to take up a post at Beaverdams, in Thorold Tp., where he served until 1815. Consequently D.W.E. Dean acquired the nickname “Priest,” and is actually so called in the 1876 atlas of Lincoln Co., which lists him as the owner of 50 acres in lot 15, concession 2 of Clinton Tp. He has not been found in the LDS index to the 1881 census. He married Mary Tufford. Maria Dean, born 1 May 1821, died 6 February 1875. She married Joseph James, and they lived on part of lot 12, concession 4 of Clinton Tp. He is likely the man of this name, aged 60, found in 1881 census with a much younger wife Roseann, aged 38, who could not possibly have been the mother of his eldest son, Johnson James, aged 27. Mary C. Huff, born 1846-47 (aged 29 in 1876) in Clinton Tp. (per her marriage record). She married 13 September 1876 in Clinton Tp., Anson A. Konkle, born 1850-51 (aged 25 in 1876) in Clinton Tp. (per marriage record), son of William and Eliza (____) Konkle. 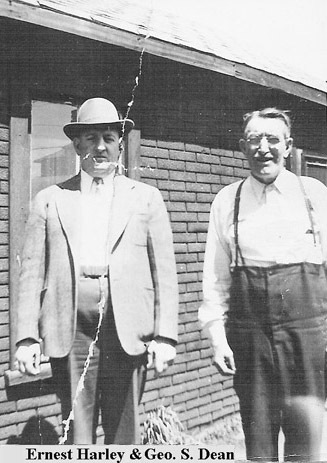 At the time of their marriage, the record of which names both sets of parents, both parties were of Clinton Tp., and the groom was a farmer; the witnesses were Solomon T. Huff and William A. Wismer, both of Clinton Tp. Solomon T. Huff, born 1847-48 (aged 26 in 1874) in Clinton Tp. (per marriage record). He married 13 October 1874 in Clinton Tp., Sophia Amelia Henry, born 1843-44 (aged 30 in 1874) in Clinton Tp. (per marriage record), daughter of James R. Henry and Mary Zimmerman. At the time of their marriage, the record of which names both sets of parents, both parties were resident in Clinton Tp., and the groom was a farmer; the witnesses were Frank Hill and Kinsley Shaw, residences unstated. Solomon T. Huff served as a witness at the wedding of his elder sister Mary C. Huff in 1876. Lyda [or Lydia?] A. Huff, born 1859-60 (aged 21 in 1881) in Ontario; still living unmarried with her parents in 1881. Philip Dean, Jr., born 10 March 1825. He was living unmarried with his parents in 1852, but afterward married Julia (or Judy?) Tufford. This was possibly before 1858, as they do not appear in the Ontario Marriage Index, 1858-1869. He has not been found in the LDS index to the 1881 census. William Eddy, born 1854-55 (aged 26 in 1881) in Ontario; still living unmarried with his parents in 1881. Lena F. Eddy, born 18 October 1886. She was living with her parents in 1901. She married by 1909, Thomas Walker, born 31 July 1881 in Scotland. They were living in Michigan by 1909. They had seven children, the youngest being Vina Jane Walker, now deceased. 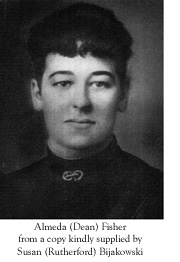 Laura F. Eddy, born 7 July 1888; still living unmarried with her parents in 1901. Lillian Eddy, born 1862-63 (aged 18 in 1881) in Ontario; still living unmarried with her parents in 1881. Sarah Jane Dean, born 8 June 1830, living unmarried with her parents in 1852. She married 1 August 1857, Jacob Huffman. Matthias Dean, born 8 August 1832, died unmarried by 1852. Hannah Dean, born 20 May 1834, died by 1852. Caroline Dean, born 27 September 1816; married Michael Spiece, and had four children. Darius Dean, born 11 October 1817, still single in 1880, when as Darius Dean, aged 63, millwright, born in Ontario, father born in New Jersey and mother born in Ontario, he appears in a household at White Rock, Huron Co., Michigan, which included his younger brother David, the latter’s son Cyrus, and others; although his brother Davis is shown as the head, it should probably have been Darius or his nephew Cyrus. He is generally stated to have remained unmarried. 8Andrew Tintern Dean, born 27 September 1819. 9David Dean, Jr., born 22 June 1820. Elizabeth Anne Dean, born 5 October 1823, died 29 December 1873, and buried at St. Anns; she married 22 September 1840, John Ennsley, by whom, according to DGT, she had six children. Susanne Dean, born 1827; married after 1852, Jim Walker. DGT does not state whether they had issue. They have not been found in the LDS index to the 1881 census of Ontario. Margaret Dean, born 1828. DGT says “she may have been the Margaret Dean who married John W. Snyder,” but shows one of the daughters of this union as married to a man who was older than this Margaret herself. Annals of the Forty more plausibly identifies Snyder’s wife as Margaret Dean, born 1812, daughter of Philip Dean (no. 3). An infant, born [and died?] 1830. 11Cyrus S. Dean, born 1831. An infant, born [and died?] 1833. 12Aaron Dean, born 11 August 1834. 5. Andrew2 Dean, of Clinton Tp., son of John Dean and Margaret Flach, was born 20 July 1796, died 27 March 1841, and was buried in St. Anns Presbyterian churchyard. He married by 1824, Mary Mingle, born ca. 1798 in Canada, living 1881, daughter of John Mingle, of ____, by his wife Catherine Snyder. 13William Dean, born probably 2 June 1823. Mary Dean, born 1853-54 (aged 7 in 1861), but this in conflict with the date of birth of the daughter Rachael. Clara Bell Cosby, born 19 November 1883 in Lincoln Co.
Oscar Cosby, born 17 June 1887 in Lincoln Co.
Omer Cosby, born 6 July 1889 in Lincoln Co.
William Dean, born ca. 1857 (aged 3 in 1861, 22 in 1879) in Norfolk Co. (per his marriage record); married 29 August 1879 in Mersea Tp., Essex Co. Hannah Plant, born 1858-59 (aged 20 in 1879) in Mersea Tp., daughter of John and Elizabeth (____) Plant. At the time of their marriage, the record of which names both sets of parents, both parties were of Essex County (township not stated), and the groom was a farmer; the witnesses were Thomas Christy and Mar— (illegible) Butler. Henry Dean, born 1858-59 (aged 2 in 1861). 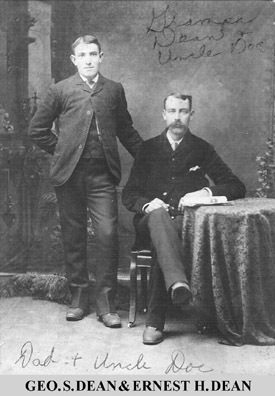 Philip Dean, born 1862-63 (aged 18 in 1881), the only child still living with his father in 1881. Emma Jane Dean, born 26 August 1856, died 26 January 1858, and buried at St. Anns. Lydia Dean, married Hamilton Nelson. She may not have been his only wife, as a Hamilton Nelson, aged 48 (thus born 1832-33) is found in the 1881 census of Grimsby Tp. with a wife Rachel and three children. Ann Dean, born 24 July 1836 (per 1901 census, although her age was given as only 40 in 1881), living unmarried with her brother William in 1861, with her brother Absalom in 1881, and again with her brother William in 1901. Catherine Dean, said to have married ____ Weaver. Annie Maria Dean, born 1850-51 (aged 11 in 1860, 20 at marriage) in Erin Tp. Described in her marriage record as a daughter of Thomas and Sarah Dean, she married 15 February 1871 in Wellington Co., Charles Ismond, born 1849-50 (aged 21 at marriage) in Erin Tp., son of Thomas and Ann (____) Ismond. 14Emery Allen Dean, born 5 June 1852 (per a family bible record and the 1901 census) in Erin Village, died 27 March 1939 at St. Joseph’s Hospital, Toronto, aged over 86 years. Michael Dean, born 9 May 1888. Mary A. Dean, born 29 April 1890. Thomas J. Dean, born 27 February 1892. Peter J. Dean, born 4 March 1896. Hannah J. Dean, born 1856-57 (aged 4 in 1861, 14 in 1871). Harmon J. Dean, born 1857-58 (aged 2 in 1861, 13 in 1871). Absalom W. Dean, born 1862-63 (aged 8 in 1871). Despite the slight discrepancy in their stated ages, he is probably the 17-year-old Absalom Dean found in the household of his uncle and aunt, John and Thirza (Dean) Shingler, in the 1881 census of Erin Tp. He is also, probably, the Absalom Dean, born 3 May 1863, with wife Marey A., born 23 August 1859, found in the 1901 census of Erin Tp. ; no children were living with them at the time. Lorine McGinnis Schultze has pointed out to us that he is probably also the Absalom Wellington Dean who died 2 October 1915 at Orten, Erin Tp., Wellington Co., at the (possibly exaggerated) age of 57 years, having committed suicide by shooting himself; he is described in the death record as a “Temperance Hotel Keeper,” and a married man. Mary M. Dean, born 1867-68 (aged 3 in 1871). Salem Adolphus Dean was born September 14, 1855, in Elgin Co., Ontario; was converted at the age of nineteen; A.B., Alleghany College, 1889; B.D., Drew Theological Seminary, 1895; entered the Ontario Conference of the Methodist Episcopal Church, Canada, 1877; entered the Detroit Conference, 1882; married Miss Mina Raymond, June 30, 1880 [this disagrees with his marriage record, which gives the date as 3 June]. [Literary work:] 1887, editor of the Prohibition Department of the Meadville Herald; 1894, editor of the Flushing Visitor, a local church paper; Published: 1893, poem, “The First Christmas”; 1894, article, “After Twenty Years” (in the Michigan Christian Advocate). Dorothy Dean, born 1904 in Michigan. Jacob P. Dean, born 1905-06 in Michigan, died 29 April 1907 at Saginaw, aged 1 year, and buried 1 May following, as a child of Russell Dean and Elizabeth Pidt. 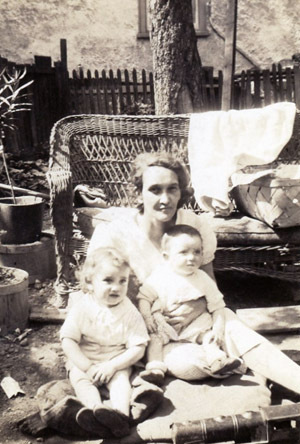 Susan Dean, born 1909 both in Michigan. Jennie Pearl Dean, born 15 July 1883 at Stockbridge, Livingston County, Michigan. She was unmarried and living at Detroit at the taking of the 1940 census, when she was a secretary for a corporate lawyer. Matilda Dean, born ca. 1844; married ____ W____, according to DGT. However, there is no Matilda Dean in the Ontario Marriage Index, 1858-1899, and the LDS index to the 1881 census does not show any woman named Matilda of this approximate age who was married to a man whose last name began with W.
John Frederick Dean, died in infancy. William Dean, died in infancy. Jessie Dean (female), born 1872-73 (aged 8 in 1881) in the USA. Flora Dean, English, born 1874-75 (aged 6 in Ontario. Mabel Dean, born 1878-79 (aged 2 in 1881) in Ontario. Mary Dean, born 1857-58 (aged 20 in 1874). She married 12 February 1874 in Clinton Tp., Henry J. Eddy, born 1853-54 (aged 24 in 1874) in the State of New York (per marriage record), son of Robert and Mary (____) Eddy. At the time of their marriage, the record of which names both sets of parents, she was residing in Clinton Tp. and he at Lewiston; the witnesses were Hiram Pletcher of Niagara and William E. Eddy of Lewiston. Seth Dean, died in infancy. Evelina Dean, died at the age of 12 years. Hesper Dean, born 1865-66 (aged 15 in 1881, 19 in 1885). She married 11 February 1885 in Clinton Tp., Byron H. Eckardt, born 1862-63 (aged 22 in 1885) in Clinton Tp. (per marriage record), son of Frederick and Magdeline (____) Eckhardt. At the time of their marriage, the record of which names both sets of parents, both parties were resident in Clinton Tp., and the groom was a farmer; the witnesses were William Haist and Electra Michener, both of Clinton. On 16 December 1885 “Byron & Hesper Eckhardt, both of Clinton Twp,” served as witnesses at the wedding, celebrated 11 February 1885 in Clinton Tp., of a Franklin H. Eckardt, aged 28, born in Clinton Tp. and resident at Campden, Ontario, son of Frederick and Margaret Eckhardt. According to DGT, this couple had five children. Romain Dean, died before 1960. A daughter, died aged 2½ years. Martha Dean, born 16 February 1869, living 1910. She married 20 December 1899 at Jordan Station, Lincoln Co., William Melvin Comfort (called Melvin William Comfort in his marriage record), born 30 April 1875, living 1910, son of Ephraim Comfort, of Clinton Tp., by his second wife, Margaret Zimmerman. At the time of their marriage, the record of which names both sets of parents, both parites were of Clinton Tp. ; the witnesses were Henry and Ada Dean, of Clinton. They had three children. Sarah Dean, born 1870-71 (aged 10 in 1881), living 1948 at St. Catharines. She married (1) 18 May 1892 at Jordan Station, Lincoln Co., Joseph H. Smith. She married (2) (as his second wife) well after 1895, Charles High, widower of her sister Lydia Dean. DGT does not state whether she had issue. See below for a photograph the 1906 High-Dean family reunion. Ada Dean (twin to Ida), born 1873-74 (aged 7 in 1881), died unmarried. She is presumably the Ada Dean who served as a witness at the weddings of her sisters Ida (1898), Eliza (1898), and Martha (1899). Ida Dean (twin to Ada), born 1873-74 (aged 7 in 1881). She married 8 Jan 1896 in Campden Tp., Lincoln Co., Harry Johnson, born 1870-71 (aged 25 in 1896) at Glasgow, Scotland (per marriage record), son of Thomas Johnson and Catherine Stewart. At the time of their marriage, the record of which names both sets of parents, she was of Campden Tp. but he of Buffalo, New York; the witnesses were Christopher Warner of Buffalo and Ada Dean of Campden. DGT does not state whether they had issue. Eliza Dean, born about 1875 (aged 5 in 1881, 23 in 1898). She married 28 June 1898 at Louth Tp., Lincoln Co., Edward Allen Moyer, born 1869-70 (aged 28 in 1898) in Campden Tp., son of William W. and Anna (____) Moyer. At the time of their marriage, the record of which names both sets of parents, she was of Campden Tp. but he of Hartford, and he was a draughtsman; the witnesses were Andrew Dean of Campden and Ada Dean of Buffalo, New York (is this residence an error?). DGT shows two children for them. Lydia Dean, born 1877-78 (aged 3 in 1881), died 27 March 1921. She married (as his first wife) 27 April 1895 at Merritton, Ontario, Charles High, who after her death married her sister Sarah. DGT shows three children for them. Dorothy Dean; married and had issue. Earl Rodney Dean, born 1912; married and has an only child, Debbie Dean, born 1950. Jane Dean, born in March 1881 (per 1881 census), living with her mother in 1901; said to have died unmarried. Vera Dean, died ca. 1935; she married and had issue. Lucy Dean, born 17 February 1885 (per 1901 census), living with her mother in 1901, died unmarried. Around 1857 David Dean from Dean’s Mills on the Wenty-Mile Creek in the Niagara peninusla bought the south end of the original Hatch land and established grist and saw mills. The long-one-storied house on the hill became the Mill House. Most of the Dean young people loved to sing and either they or their descendants figured in the later choir life of the community — Eleanor Dean married Henry Hatch; Susanne Dean married Amrbose High. Andrew Dean taught the singing school and energetically and faithfully fathered the first then-new church choir of Maple Gove until it moved to Eden. Darius Dean taught school. He married first Elizabeth High (daughter of Andrew High). His second wife was Hannah (daughter of Amoss [sic] High. Later Darius Dean became a miller at Jordan, Ontario. David Dean and his wife were certainly in Bayham Tp. at the taking of the 1861 census, which calls him a farmer and mill owner, and gives the family’s religion as Free Will Baptist; the ages of the children Cyrus (16) and Mary (14) as there given are impossible, as these children were not even alive in 1852, and in the case of Cyrus the figure cannot be reconciled with later records. The 1871 calls him a millwright and gives their religion as Free Baptist. The 1881 census calls him a millwright and gives their religion as Baptist. In the 1880 U.S. census David Dean, aged 57, farmer and millwright, born in Ontario, father born in New Jersey and mother born in Ontario, appears, ostensibly as the head, in a household at White Rock, Huron Co., Michigan, which included his brother Darius and son Cyrus. Surely, given the continuity of his residence in Bayham Tp., Ontario, this must be a mistake, and he was merely a visitor at the time; for although he is indicated as being married, there is no wife recorded with him. Ada Dean, born 1875-76 (aged 5 in 1881) in Ontario. Esco Dean, born 1878-79 (aged 2 in 1881) in Ontario. Ernest Dean, born in December 1880 in Ontario. Joseph Dean, born about 21 May 1848, died 1 March 1865, aged 16 years, 9 months, and 10 days, and buried with his parents. Lincoln R. High, born 1869, died 1929. Margaret M. High, born 1876, died 1950. Mary Olive High, born 1882, died 1951. Willard Hatch Lane, of Michigan, Private in the U.S. Marine Corps in World War I, born 12 October 1894, died 1 April 1968. Donald Garner Lane, Capt. in the R.C.C.S., born 1903, died 1989. Mary Anna or Mirianna Hatch, called Mirianna in the 1950 death notice of her sister Helena bu Mary Anna on her own tombstone, born 1874, died (unmarried) 1959. Louise/Louisa Hatch, called Louisa in the 1950 death notice of her sister Helena but Louise on her own tombstone, born 1878, died (unmarried) 1970. Ida May Dean, born 16 October 1879. Harry A. Dean, born Jan 21 1882. Alberta A. Dean, born Jul 29 1885. Viola B. Dean, born Sep 26 1890. Merwin Dean, born 1877-67 (aged 2 in 1880, 3 in 1881) in Ontario, no longer living with his father in 1901. Donald Henry Dean, born 19 September 1907 at St. Thomas, Ontario. He is said to have married Mary Lucille Ladd, and had a son, Harry D. Dean. Ira Dean, born 24 November 1884 in Ontario. Alfred Dean, born 8 November 1891 in Ontario. Mary L. Dean, born in July 1858, died 14 August 1858, aged 5 weeks, and buried with her parents. Mary L. Dean, born 1860-61 (aged 10 in 1871, 20 in 1881, 26 in 1886), living unmarried with her parents in 1881. Like that given for her brother Cyrus, the age of 14 years given for this child in the 1861 census, implying a birthdate of 1846-47, is utterly erroneous, as in 1852 she had not even been born. She married 29 Dec 1886 in Bayham Tp. Towsend Lounsbury, born 1857-58 (aged 28 in 1886) in Houghton Tp. (per marriage record), son of Sylvester and Sybil (____) Lounsbury. At the time of their marriage, the record of which names both sets of parents, both parties were of Bayham Tp., and the groom was a farmer; the witnesses were David O. Dean of Michigan, U.S.A., and Mary Lounsbury of Bayham. A little earlier, “Townsend Lousbery and Mary L. Dean, both of Bayham” served as witnesses at the marriage, celebrated 7 July 1886 at Brownsville, of Electa Marilda Lounsbury, aged 26, born in Houghton Tp. and resident in Bayham (daughter of Sylvester and “Sirvilla” Lousbury) to William H. Segar. David Dean, Jr., born 1863-64 (aged 7 in 1871), living unmarried with his parents in 1881, died unmarried according to DGT. He is presumably the David O. Dean of Michigan who served as a witness at the weddoing of his sister Mary in 1886. Mary Dean; said in DGT to have married Peter Monson, although we cannot find such a couple in the Ontario Marriage Index, 1858-1886. Fredrick Dean, born 12 June 1872 (per 1901 census), still living unmarried with his parents in 1901. Edna Dean, born 1874-75 (aged 7 in 1881), no longer living with her parents in 1901. Melvin Dean, born 1875-76 (aged 6 in 1881), no longer living with his parents in 1901. Celia Dean, born 1878-79 (aged 3 in 1881), no longer living with her parents in 1901. Joseph Dean, born 1879-80 (aged 2 in 1881), no longer living with his parents in 1901. Frank Dean, born 18 July 1882 (per 1901 census), still living unmarried with his parents in 1901. 15Benjamin Dean, born 12 May 1851. Christine Dean; said in DGT to have married Benjamin Barnhart, although we cannot find such a couple in the Ontario Marriage Index, 1858-1899. Cornelia Dean; said in DGT to have married Leonard Matthews, although we cannot find such a couple in the Ontario Marriage Index, 1858-1899. John Dean; said in DGT to have married (1) Caroline Loop; married (2) Maggie Geyer, although we cannot find either marriage in the Ontario Marriage Index, 1858-1899. 16Israel Dean, born 23 April 1862 (per 1901 census) in Lincoln Co.
Charity Dean, born 1864-65 (aged 16 in 1881); living unmarried with her parents at the taking of the 1881 census. She married 4 October 1881 in Willoughby Tp., George Heximer. William Dean, born ca. 1856. Doran Robson Dean, born 19 November 1896 at Victoria. He married 1 August 1922 at Vancouver, Evelyn Beatrice Jones. Cyrus Sumner Dean, probably born 24 September 1899 (per army record) at Fort Erie, Ontario, although his birthdate is given as 24 September 1900 in the 1901 census. He enlisted in the Canadian Over-Seas Expeditionary Force on 8 February 1916 at Vancouver, giving his address as 1810 Cedar Street, his occupation as bugler, his marital status as single, his religion as Church of England, his age as 16 years and 4 months, his place of birth as Fort Erie, Ontario, and the name of his father as Cyrus Dean. He married 15 May 1926 at Vancouver, Helen Aletha Hackman. Romane Dean, born ca. 1859. John Dean; married Mary Young. Edward Dean. An “Edde H.M. Dean,” born 31 March 1879, is found next door to Cyrus Dean, above, in the 1901 census of Victoria, B.C., in which he is called a farmer. We have not found him in other records. Lillian Dean; said to have married the Rev. ____ van Riperdead, although we cannot find her in the Ontario Marriage Index, 1887-1899. Ethel P.V. Dean; said to have married 19 June 1895 in Bertie Tp., Arthur H. Parsell, whose surname is given in family records as Purcell. Oberia Dean; said to have married ____ Brown, although we cannot find her in the Ontario Marriage Index, 1887-1899. Beatrice Maud Hansel, born 21 April 1881, died (unmarried) in 1955 at Buffalo. Franklin George Hansel, born 1896, died in infancy. William Fitch, said to have been born 29 April 1880 although this would surely have been before his parents’ marriage. Jennie Fitch, born 1883; married Orme Fairley. Francis Overholt, born 29 August 1880; he married Sarah ____. John William Franklin Fisher, died 1964. He married Winnifred May Honsberger, born 26 May 1925 (? ), died 1990. Kyle Murry Scott MacDougall, born 1998. Emily Jane Scott, born 1997. Catrina May Scott, born 1999. Louise Patricia MacDougall, born 1969; unmarried. Karli Olivia Bijakowski, born 1999. Mitchell Franklin Bijakowski, born 2002. Jessie David Fisher, born 1982. Kendra Dawn Fisher, born 1984. Estella Dean, born 31 August 1865, died 24 March 1887 at Hamilton, Ontario. DGT states that she married “____ Newman,” which inclines us to think she could have been mother of the Estella Nunan found in the household of her brother Seward in 1901. However, the records of Susan (Rutherford) Bijakowski state that Estella Dean married Charles Herold, and had a son, Arthur Herold. We are presently unable to resolve the discrepancy, as there is no entry for an Estella Dean in the Ontario Marriage Index, 1869-1899. Elsie Dean, born 26 April 1891 (per family record) or 1892 (per 1901 census), died 2 November 1950, and buried at Tobermory; married 20 October 1909, Edward James Hopkins, son of John C. Hopkins and Ellen Cuff. They do not appear to have had issue. Ada Dean (twin to Ida), born 15 August 1893, died by 1901. Ida Dean (twin to Ada), born 15 August 1893 at Hamilton, died 11 September 1947 at Walkerton, Ontario. She married 17 September 1918, Edwin Percival Belrose, born 17 November 1877 at Owen Sound, died 20 December 1940 at Hudson Bay, Saskatchewan, son of Jacob Belrose. This couple, who lived in various places in Saskatchewan including Mendel (about 1919-1920), Craik (about 1921-1933), and Hudson Bay (1936-1940+), had 15 children. Eva May Dean, born 8 June 1921, died 3 June 1961. She married 7 March 1941, John Hicks. Orville Elroy Dean, born 7 December 1924; married 27 July 1946, Jennie Wilson. Shirley Joan Dean, born 22 July 1932; m 18 August 1951, R.J. Bell. Roy Henry Dean, born 8 June 1934; married 5 June 1954, Adeline Coture. Margaret (“Maggie”) Dean, born 11 February 1898 in Ancaster Tp., Wentworth Co., died 6 September 1966, and buried at Tobermory. She married 1 November 1918, William Oscar Smith, born 3 October 1897 at Owen Sound, son of William Smith and Helena May Belrose. They had two sons. Lillian Dean, born 27 October 1900 at Tobermory, died 10 January 1977 at Toronto, and buried at Tobermory. She married William H. Barney, born 29 August 1912, son of Edward Barney and Annie Westlake. 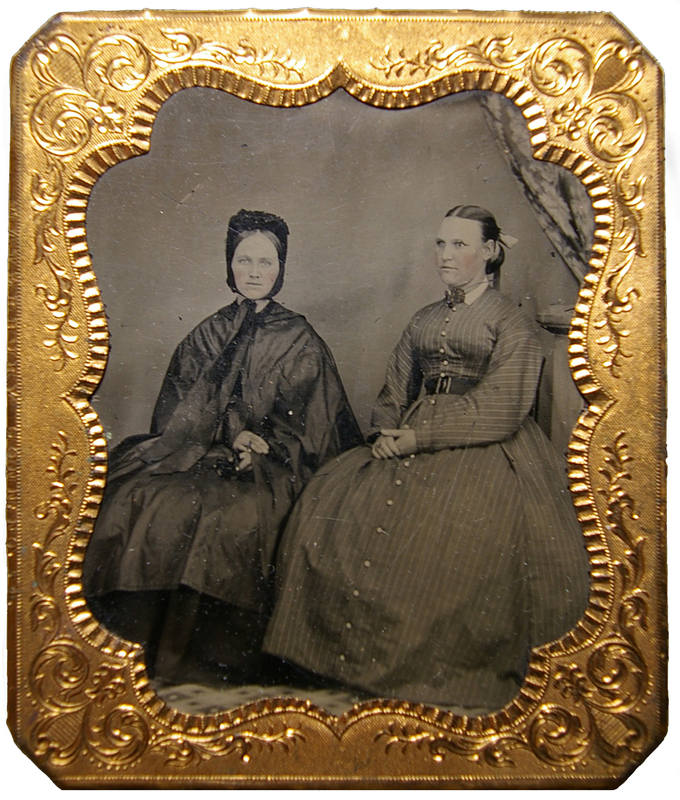 DGT states that she “lived in Weston, York Co., Ontario, in 1860,” which statement is obviously in error as to the date. Aaron Dean, born 27 September 1902 at Tobermory, died 20 July 1978 at Owen Sound, and buried at Tobermory. He married 10 November 1935, Eileen Spears, born 15 August 1915 at Coquitlam, British Columbia, daughter of Thomas Spears and Mary Ellen Bartman. They had six children. Daisy Dean, born 21 January 1905; married before 1924, Gordon Hopkins, born 15 July 1901 at Tobermory, died there 1 January 19__, son of William Henry Hopkins and Ruth Matheson. They had four children. Henry Dean, born 6 March 1907, died (unmarried) 18 November 1922. Peggie Caroline Dean, born 9 December 1939 at Lion’s Head, Bruce Co.; married 6 March 1959, Kent Teeple. She was the late Peggy (Dean) Teeple referred to above. William Bruce Dean, born 22 December 1941 at Toronto; married 8 May 1965, Freda Adams. Mildred Dean, born 14 March 1911 at Tobermory; married 3 November 1933 at Tobermory, Roy Hatt, born 15 Feb 1911 at Lion’s Head, Bruce Co., died 5 April 1972 at Tobermory. They had five children. Orlon Alvin Dean, born 28 June 1913 at Tobermory, died there 25 October 1973, and buried there. He married before 1937, Velma Smith, born 14 September 1917 at Tobermory, daughter of Adelbert Huston Smith and Julia May Spears. They had six children. Bertha Dean, born 26 November 1871, died (probably unmarried) 18 July 1891 at Buffalo. DGT states rather uncertainly that she married “____ Seward,” but adds, “the source is unclear; a Seward Dean may have been a brother of Bertha.” In view of the fact that Bertha did indeed have such a brother, we believe that the suggested marriage should be disregarded, particularly as no such marriage appears in the Ontario Marriage Index, 1887-1899. John (“Jack”) Francis Dean, born 2 October 1901. 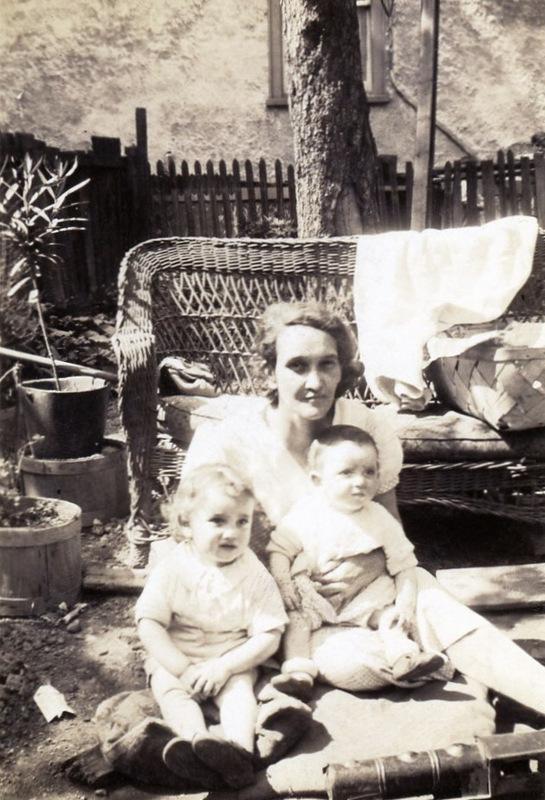 Alfretta Dean, born 28 April 1906 at Waterdown; married ____ Hatt. John Anthony Pitts, born 9 January 1937 at San Bernardino, California, died 13 May 1997 in Texas, and was cremated. His father is named as James Pitts in his birth record, but it is unclear whether his parents were ever married; and he is found in the household of his maternal grandparents in the 1940 census. His daughter-in-law Mary Pitts supplied several details on this family group. Carol Spratt, born 4 January 1946 at San Diego, California. Jessie Dean, born 17 March 1901; married Russell Lye. Helen (“Nellie”) Dean, born 8 April 1860, still living unmarried with her parents in 1881, when she was a servant. 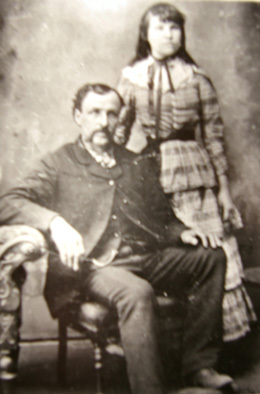 She married 23 May 1885 (per the family bible record), Elmer Birdsell. John Salem Dean, born 20 November 1861, died 1953. He was a servant in 1881, served as a witness at the marriage of his younger sister Emroy in 1888, and was still living unmarried with his widowed father in 1901. We have not found a marriage for him, and we have not found him in the 1911 census. Andrew Dean, born 25 May 1863, died 22 March 1881 (per the family bible). We have not found a marriage for him. Emroy Dean (female), born 19 August 1865 in Charlotteville Tp., Norfolk Co., died 28 March 1942, and buried in Greenwood Cemetery, Waterford. She married 29 February 1888 in Waterford Tp., Norfolk Co., Thomas E. Kitchen, of Round Plains, born 1864-65 (aged 24 in 1889) in Windham Tp., son of Aaron and Sarah Ann (____) Kitchen. At the time of their marriage, the record of which supplies the names of both sets of parents, both parties were residing in Windham Tp., and the groom was a blacksmith; the witnesses were Salem Dean and Mary Dayfoe (sic), both of Windham Tp. Calvin James Dean, born 15 June 1867, living 1881. We have not found a marriage for him, nor have we found him in the 1901 census. Agnes Evelyn Dean, born 18 September 1899 in the Rainy River District. Ernest Harley Dean, born 27 April 1901 in the Algoma District. Cybil Andette Dean, born 9 June 1903 in the Thunder Bay District. 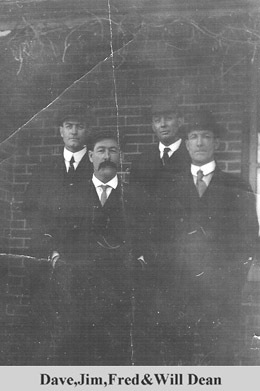 George E. Dean (position uncertain). Hazel Dean, born 19 August 1901 (per 1901 census) in Alberta. Dora Dean, born 1903 (?) (aged 7 in 1911). Elmetta Dean, born 1906 (?) (aged 5 in 1911). 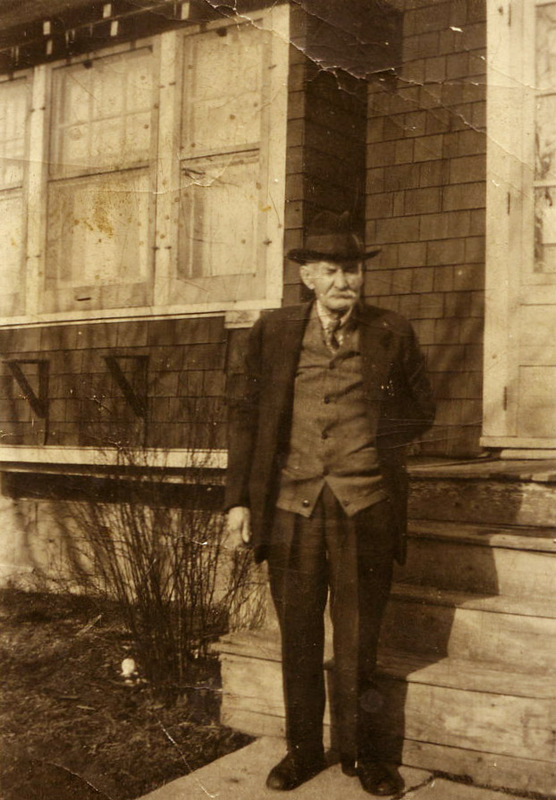 Palmer Dean, born 3 March 1875 (per family bible) or 3 March 1878 (per 1901 census) in Ontario, living 1901. He is found at Revelstoke, British Columbia, in the 1901 census, at which time he was a locomotive fireman, Presbyterian in religion, and still unmarried; he was lodging with a group of persons with no relationship to one another. We have not found him in the 1906 or 1911 censuses. William Dean, Jr., born 6 August 1879. We have not found a marriage for him. Frederick Marcus Dean, born 31 May 1880. We have not found a marriage for him. 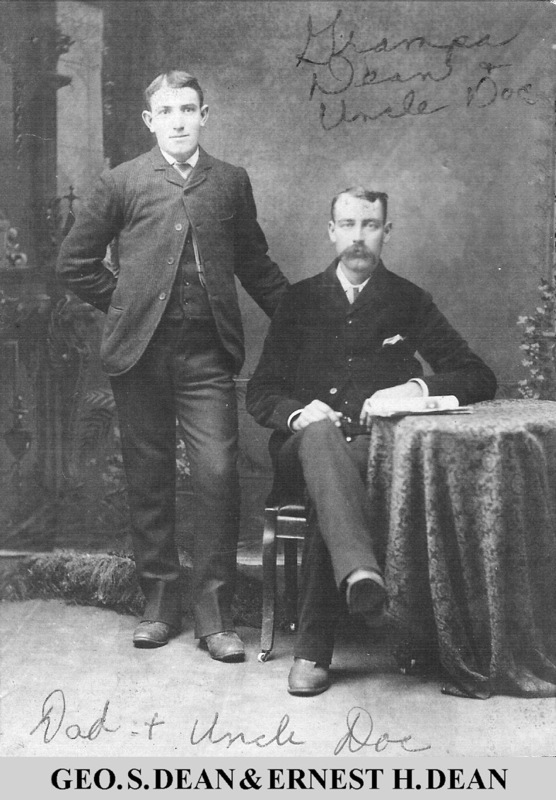 Ernest Harley Dean, born 26 March 1884 at Windham Centre, still living unmarried with his widowed father in 1901. He appears at no. 120-2 South Brodie Street, Fort William, in the 1911 census, at which time he was a fire-engine captain, and was still single. We have not found a marriage for him. Injured Saturday when he fell down a flight of stairs at the residence of his daughter, Mrs. Anna Burleigh, 206 Van Horne Street (1089 Dupont). 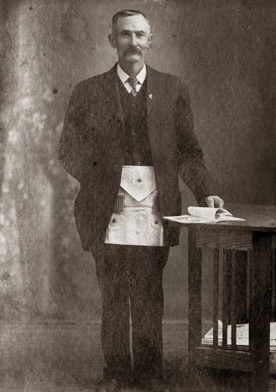 He was widely known in Masonic circles in Durham Ont., having been a member of the order there for 51 years. He also belonged to the Orange Order. For the past 7 years he lived in Toronto. A carpenter by trade, he retired 25 years ago. Suddenly at St. Joseph’s Hospital, Toronto, in his 90th year [an exaggeration], husband of the late Abigail Vollett Dean. Funeral services at the home of his daughter, Mrs. Adeline Stothers, 239 Emerson Ave.
Mr. Dean came to Durham in 1881 or 1882 when the Grand Trunk Railway branch was opened, being the first section hand to work on the Durham-Palmerston branch. More than 60 years ago he was married to Abigail Vollett, daughter of the late Mr. and Mrs. Henry Vollett, who died about 40 years ago. Mr. Dean and family left here upwards of 30 years ago. Surviving are Mrs. Archie McDermid (Windsor), three other daughters, Adeline, Annie, and Ruby, all of them married and living in Windsor and Toronto, two sons, Lorne, in Windsor, and Salem, in England. The funeral will be held … to Maplewood Cemetery…. Born in Erin, he lived successively in Durham, St. Thomas, and Windsor before coming to Toronto seven years ago. Henry Allen Dean, born 30 May 1883, died 11 March 1895. Elva May Dean, born 7 February 1886, died 2 October 1949 at Riverside, Ontario; married 27 June 1906, Archibald Alvin McDermaid. She is described as of Windsor at her father’s death in 1939. Adeline Thyrza Dean (known as Raeline, according to Charles A. Dixon), born 18 October 1888; married 23 June 1909 at Toronto, William James Stothers, who at the time of their marriage was a carpenter, of Toronto. Charlotte Dean, born 7 December 1890 (per family bible), died 23 August 1893 (her funeral notice gives her age at death as 2 years, 7 months, 16 days, but it should have said 6 months), and buried two days later in Barber’s Cemetery. Lorne Dean, born 18 August 1892, died 20 August 1958 at Riverside, Ontario. He was a soldier in World War I, and was living at Windsor at the time of his father’s death in 1939. Viola Catherine Burleigh born 25 October 1913, died about 1976 at Toronto; married (1) Guy Hickey; married (2) Fred Shelley. 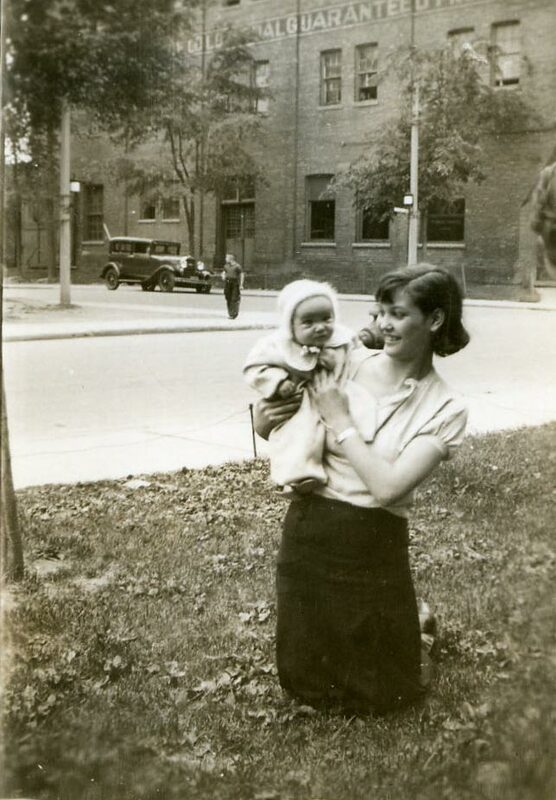 Charles Allen Dixon born 29 December 1934 at Toronto; married (1) Maureen Mary Mullin; married (2) Eleanor Anne Inkster. 4 children by first wife and 1 by second. Gerald Rosair Dixon born 23 September 1936 at Toronto, died 7 February 2004, Hamilton; married Theresa Loretta Brown. 1 child. Roy Ronald Dixon born 22 April 1940 at Toronto, died 5 June 1999 at Oshawa, Durham Co., Ontario. Victoria Abigail Burleigh born about May 1920 in the U.S., died 29 March 1923 at Toronto. Sharon Lynn Hamilton; married ____ Earles. Emery Salem Dean, born 13 September 1897, died 31 August 1976 at Preston, Ontario. When he registered for military service in World War I he exaggerated his age, claiming to have been born in 1895. He was captured at Vimy Ridge and became a prisoner of war. He married 22 February 1919 in Surrey, England, Elsie May Powley, died 22 January 1982 at Preston, Ontario. They were still living in England at the time of his father’s death in 1939. They had four children, including Salem Allan Dean, our informant (who kindly supplied the photograph of Emery Allen Dean above). Ruby Abigail Dean, born 8 February 1900, died ____; married 6 July 1921, Frederick Reuben Hartley Turner. Elaina Dean, born 1872-73 (aged 8 in 1881), no longer living with her parents in 1901. As “Alzina” Dean, of Bertie Tp., aged 21 years, daughter of Benjamin and Elizabeth Dean, she married 19 November 1892 in Welland Co., Freeman A. Johnston, born 1865-66 (aged 26 at marriage) in Bertie Tp., son of Abraham and Fannie (____) Johnston. 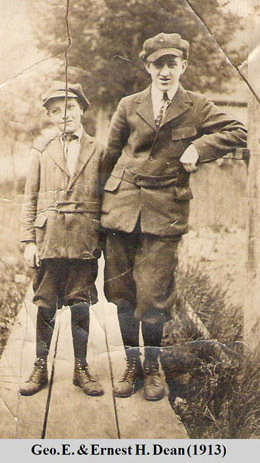 Alfred Dean, born 1873-74 (aged 7 in 1881), no longer living with his parents in 1901. Rebecca Dean, born 1875-76 (aged 5 in 1881), no longer living with her parents in 1901. Patricia Ann Dean, born 5 March 1942, died 24 August 1962. Mary Ellen Dean; married Keith Robinson. Shirley Dean; she married Victor Semley, and resides at Stevensville. Only known child: Brenda Semley. Calder Douglas Dean; he married Loretta ____, and resides at Stevensville. Issue: Teresa Dean; Karen Dean; Richard Calder Dean, Jr.
Morley Max Dean; he married Joyce Eleanor Winger, and resides at Stevensville. Issue: James Morley Dean; Elizabeth Ann Dean. Myrtle Olive Dean, born 12 July 1906 at Stevensville, Bertie Tp., died 30 April 1972 at Douglas Memorial Hospital, Fort Erie. She married Edgar George Kramer, died 22 October 1981 Port Colborne, Welland Co. No known issue. Esther Dean, born probably in late 1881, in Bertie Tp. (per marriage record), married 21 Dec 1898 in Bertie Tp., Emerson Zimmerman, born 1871-72 (aged 26 in 1898) in Bertie Tp., son of Elias Zimmerman and Barbara Wilhelm. At the time of their marriage, the record of which names both sets of parents, both parties were of Bertie Tp., and the groom was a farmer; the witnesses were David Doan and Laura Rogers, both of Bertie Tp. Although the record gives her age as 18, this is unlikely as it would place her birth in 1879-80, in which case she should have appeared with her parents in the 1881 census. Israel Dean, born 31 March 1883. Sarah Dean, born 15 April 1885, in Bertie Tp. (per marriage record). She married 21 December 1904 in Bertie Tp., her sister Esther’s husband’s brother, Frank Zimmerman, born 1879-80 (aged 24 in 1904) in Michigan (per marriage record), son of Elias Zimmerman and Barbara Wilhelm. At the time of their marriage, the record of which names both sets of parents, both parties were resident in Bertie Tp., and the groom a farmer; the witnesses were Chester Zimmerman and Laura Dean, both of Bertie. Laura A. Dean, born 6 February 1887, living 1904, when she served as a witness at the wedding of her elder sister Sarah. Ida Dean, born 25 July 1886 in Willoughby Tp. She married 30 September 1903 in Welland Co., Michael M. Beck, born 1876-77 (aged 26 at marriage) in Willoughby Tp., son of Michael Beck and Catharine Shabel. The marriage record names both sets of parents. Edna Dean, born 23 October 1887. She married 1 July 1912 in Welland Co., Albert Roy Climenhage, born 1884-85 (aged 27 at marriage), son of Christi[a]n Climenhage and Maggie Beam. The marriage record names both sets of parents. Cora or Dora Dean, born 27 December 1890. DGT calls her Dora, but it was as Cora Dean, aged 24 years, that she married 2 November 1815 in Welland County, George A. Brown, born 1888-89 (aged 26 at marriage), son of George A. Brown and Elizabeth McKin. Roy Dean, born 28 August 1895 in Willoughby Township, Welland County, died 22 July 1974 in Bertie Township, Welland County. He married (1) 28 August 1923, ________. he married (2) (as her second husband) 19 April 1947, Martha A. Minor, born 1902, died 31 March 1988, widow of Roy D. Barnhart. This information comes from his nephew Harry Dean, who tells us that the family record in the bible of Israel Dean (1862-1914) shows a marriage for Roy Dean on 23 August 1923, without naming a wife. 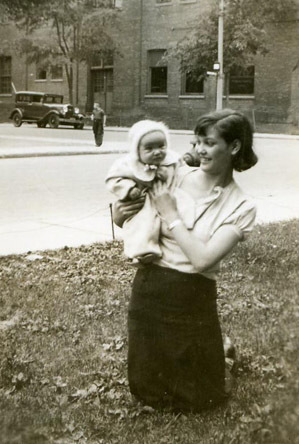 Linda Anne Miller, born 18 January 1956 in Fort Erie General Hospital, Fort Erie, Ontario. She married (1) 17 January 1976, David Matt Wallace, born 24 March 1956, died 27 March 2002. She married (2) 8 December 1990, Jared Bradley Garman, born 29 September 1953. Dean William Miller, born 29 March 1961, died 18 July 1982 at Buffalo, New York. Dominique Madeleine Anne Picard, born 16 June 1996 in Memorial Hospital, Bowmanville, Ontario. Erik Dean Mackenzie Picard, born 19 December 1998 in Memorial Hospital, Bowmanville. Sebastien Andrew Remi Picard, born 18 October 2003 in Oshawa General Hospital, Oshawa, Ontario. Ava Angelina Dean, born 17 October 2005 in Ajax Pickering General Hospital, Ajax, Ontario. As printed in Newsletter of the Niagara Peninsula Branch Ontario Genealogical Society, May 1991. We have reproduced this edition exactly, except that the editorial comments, originally placed in parentheses, are here placed in square brackets, and periods have been added after abbreviations for the sake of clarity. John HAVENS died September 7, 1858 aged 42 yr 8 mo 23 dys. Sarah Catharine YEMEN dau of John & Mary HAVENS d December 22, 1861 age 20 yrs 3m 11 dys. From a photocopy kindly supplied by J. Frederick Dean, of Thunder Bay, Ontario. Punctuation has been sparingly added for clarity. Nellie Dean to Elmer Birdsell May 23rd 1885. William Dean, June 24th 1823. Mary Ann Harley, April 15th 1839. Hellen Dean, April 8th 1860. John Salem Dean, October 20th 1861. Andrew Dean, May 25th 1863. Emroy Dean, August 19th 1865. James Calvin Dean, June 15th 1867. George Secord Dean, Feby. 6th 1869. David McCall Dean, March 26th 1871. Palmer Dean, March 3rd 1875. William Dean, August 6th 1878. Frederick Marcus Dean, May 31st 1880. Ernest Harley Dean, March 26 1884. Andrew Dean, March 22nd 1881. 1. 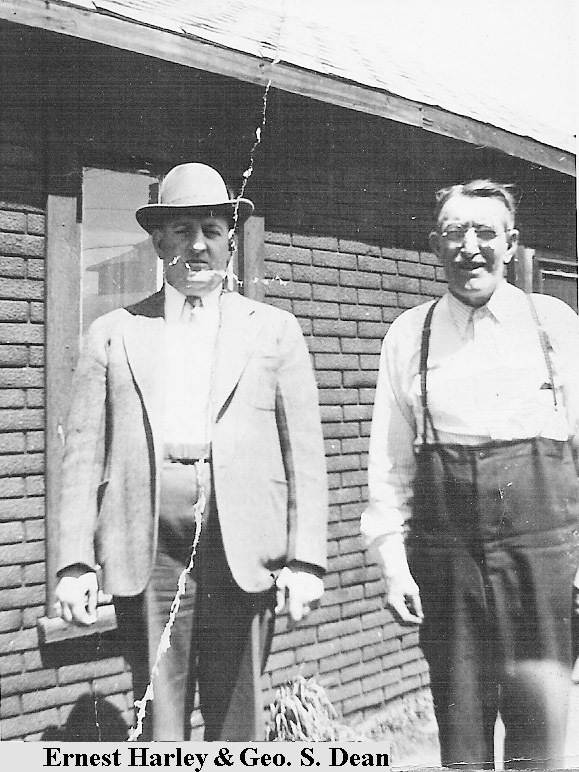 Cecelia and Roland Botting, The Deans of Gainsboro Township (s.l., n.d.). 2. [Dean family bible record], printed in Newsletter of the Niagara Peninsula Branch Ontario Genealogical Society, May 1991. 3. The Deans of Gainsborough Township gives the month and year but not the precise date. A copy of this record was sent to us by Marietta Pickell before we had seen “Marriage Records of the Zion Lutheran Church at Oldwick,” Genealogical Magazine of New Jersey, 40 (1965):10ff. ; a copy of this transcription formerly available online at http://members.aol.com/njdata/oldwick.html can still (November 2012) be found in the Internet Archive. Zion Evangelical Lutheran Church is the oldest surviving Lutheran congregation in New Jersey. 4. Based on her age at death as given on her gravestone. This is evidently the basis for the (somewhat inconsistent) calculations in DGT, which says 16 March on p. 1 and 15/17 March on p. 28. The old Dean family bible record, as printed, says 14 days; we are grateful to Scott Ercit for pointing out the discrepancy. 6. On Margaret’s parents see John Blythe Dobson, “The German Origin of Andreas Flach of Flocktown, German Valley, Roxbury Township, Morris County, New Jersey,” The Genealogical Magazine of New Jersey 92 (2017): 131-135. The first 152 volumes of the Daughters of the American Revolution Lineage Books show no competing identification of this Private John Dean. 9. Theodore Frelinghuysen Chambers, The Early Germans of New Jersey: Their history, churches, and genealogies (Dover, N.J., 1895), p. 165. 10. Deed from Conrad and Mary Bunn to John Dean, 13 May 1783, held at the Registry Office, Trenton, N.J., from a copy kindly provided by the late Peggy (Dean) Teeple, of Sarnia, Ontario. 11. Rate list of Roxbury Tp., Morris Co., N.J., 1784, held at the Registry Office, Trenton, N.J., from a copy kindly provided by the late Peggy (Dean) Teeple. 12. Harriet Stryker-Rodda, ed., Some Early Records of Morris County, New Jersey, 1740-1799 (New Orleans: Polyanthos, 1975), p. 153. The database New Jersey Census, 1772-1890 by Accelerated Indexing Systems, available online by subscription to Ancestry.com, claims the existence of a 1793 “June Tax list” mentioning a John Dean in Roxbury Tp. ; this seems unlikely to be a different list. 13. Brianne Kelly-Bly, ed., Morris County Militia, available online at http://www.rootsweb.com/~njmorris/military/morrismilitia.htm. 14. These five children were: Matthias, born 2 October 1772; Aaron, born 22 October 1774; William, born 7 February 1776; Mary, born 9 June 1778; and Daniel, born 23 December 1781. See LDS patrons’ submission records, batch 7132328, sheets 42-3, on microfilm no. 539,007. John Littell, Family records of genealogies of the first settlers of Passaic Valley and [the] vicinity above Chatham (1851), seemingly refers to several of these children; see pp. 182 (for Matthias), 368 (for Aaron), and 419 (for William). “Catherine Dean, daughter of John ?,” who married Gilbert Bodine (1761-1838), of Chester Tp., Morris Co. (p. 269). A Jonathan Dean married 2 June 1797 in Morris Co. (LDS Vital Records Index), Esther Fairchild, who is treated in J. Percy Crayon, Rockaway Records of Morris County, N.J. 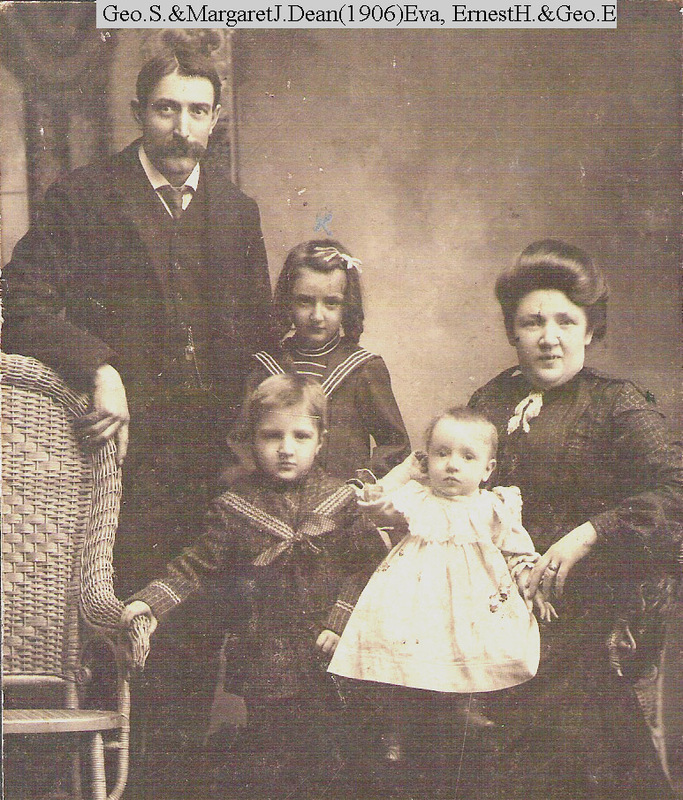 Families (Rockaway, N.J., 1902); perhaps Jonathan was the one of this name who was later a member of Mt. Olive Presbyterian Church. 16. Annals of the Forty, 4:46-7. 18. Maurice E. Comfort, “Gainsborough Presbyterian Church Records,” Families (Ontario Genealogical Society), 18 (1979): 75-83, at p. 78. 19. Annals of the Forty, 8:63. DGT cites T.H. Snyder, The Snyder Clan, which we have not seen. 20. We assume he is also the E. Snyder who authored the notes on the Dean family archived at http://web.archive.org/web/20010622172703/http://www.aloha.net/. 21. See DGT, p. 24 (where her dates are wrong) and p. 29 (where she was included in a list of unplaced Deans). An article from an unidentified newspaper, furnished by Corlene Taylor, identifies her as a twin sister of Philip Dean, although we await confirmation of this in New Jersey sources. 22. Annals of the Forty, 1:89. 23. Annals of the Forty, 8:63. He and their issue are mis-identified in DGT, p. 24. 25. Canada GenWeb’s Cemetery Project, at http://geneofun.on.ca/names/photo/1026633, kindly brought to our attention by Scott Ercit. 26. Annals of the Forty, 2nd ed., 6:43 (we have not seen the first ed. of vol. 6). 27. Corlene Taylor, “Records of the Presbyterian Church, Clinton and Grimsby, 1819-1870,” Families (Ontario Genealogical Society) 26 (1987): 26-32, at p. 26. 28. Pre-1861 censuses and assessments of Erin Tp., various years, PAC microfilm no. M-7746. Women are not separated into adults and children in 1826, but we have suggested a breakdown which seems compatible with later returns. 29. Maurice E. Comfort, “Gainsborough Presbyterian Church Records,” cited above, at pp. 81-82. 30. 1852 Census of Canada, Ontario, Haldimand Co., Cayuga Tp. North, p. 15; PAC microfilm no. C-11725 [Family History Library microfilm no. 349,211]; transcribed by Diane Thibideau & Bonnie Ewing for OntarioGenWeb, at http://www.census-sense.com/ogw/transcript.asp?id=983. 31. Assessment Roll of the Township of Erin Tp., Wellington Co., Ontario, 1830, available online at http://web.archive.org/web/20030610193842/ http://home.attbi.com/~priestner/Erin/censuspre1861/c1830.htm. 32. Assessment Roll of the Township of Erin Tp., Wellington Co., Ontario, March 5, 1832, cited above. 33. Assessment Roll of the Township of Erin Tp., Wellington Co., Ontario, 1830, cited above. 34. Assessment Roll of the Township of Erin Tp., Wellington Co., Ontario, March 5, 1832, cited above. 35. 1881 Census of Canada, Ontario, Wellington South, Erin Tp., district 151, sub-district E, division 2, p. 50; PAC microfilm no. C-13258 [Family History Library microfilm no. 1,375,894. We cannot precisely identify this Absalom Dean, although there is little doubt that he was of the present family; see the list of unplaced persons at the end. 36. Pre-1861 censuses and assessments of Erin Tp., various years, PAC microfilm no. M-7746. 37. 1871 Census of Canada, Ontario, Wellington Co., Erin Tp., District 2, p. 74; PAC microfilm no. C-9947. 38. William Havens, Jr., was a son of William Havens, Sr. (1738-1800), U.E.L., as stated in Annals of the Forty, 5:37. However, in its discussion of the earlier Havens ancestry, this work makes somewhat naïve use of an obviously modern commemorative plaque, which implies that the Canadian immigrant was a grandson of John Havens, of Portsmouth, Rhode Island, and Navesink, New Jersey. The man of Portsmouth was fathering children before the mid-1670s, and the chronological unlikelihood of such a connection had been pointed out some years before in Henry C. Havens, The Havens family in New Jersey (Trenton, N.J., 1933), 26-27. 39. Davis Godfrey Durham, James Durham, U.E., of Niagara, and his descendants in the United States and Canada, 1740-1987 (Wilmington, Delaware: privately published, 1988), 138-39. 40. 1852 Census of Canada, Ontario, Haldimand Co., Cayuga Tp. North, p. 15; PAC microfilm no. C-11725 [Family History Library microfilm no. 349,211]; transcribed by Diane Thibideau & Bonnie Ewing for OntarioGenWeb, at http://www.census-sense.com/ogw/transcript.asp?id=983. 45. The Rev. A. J. Fretz, A Genealogical Record of the Descendants of Christian and Hans Meyer and other Pioneers… (Harleysville, Pennsylvania, 1896), 92. This reference was kindly brought to our attention by Scott Ercit. 46. The Rev. A. J. Fretz, A Genealogical Record of the Descendants of Christian and Hans Meyer and other Pioneers… (Harleysville, Pennsylvania, 1896), 92. This reference was kindly brought to our attention by Scott Ercit. 47. 1852 Census of Canada, Ontario, Haldimand Co., Cayuga Tp. North, p. 13; PAC microfilm no. C-11725 [Family History Library microfilm no. 349,211]; transcribed by Diane Thibideau & Bonnie Ewing for OntarioGenWeb, at http://www.census-sense.com/ogw/transcript.asp?id=983. 48. 1871 Census of Canada, Ontario, Wellington Co., Erin Tp., District 2, p. 74; PAC microfilm no. C-9947. 49. Lincoln County death registrations, no. 010379. 50. 1881 Census of Canada, Ontario, Lincoln Co., Clinton Tp., district 145, sub-district D, division 1, p. 25; PAC microfilm no. C-13255 [Family History Library microfilm no. 1,375,891. 51. Lincoln County, Ontario, marriage registrations, no. 006862-86. 53. Archives of Ontario, Lincoln County Surrogate Court Wills, file no. 454, indexed in Surrogate Court Index of Ontario, Canada, 1859-1900 — Volume 5, Lincoln and Welland Counties (Agincourt, Ontario: Generation Press, 1988); not personally seen. 54. Annals of the Forty, 3:51-5. 55. Annals of the Forty, 1:75. 56. Annals of the Forty, 4:47. 57. Ontario Genealogical Society, Niagara Peninsula Branch, 1828 Census [of] Welland County… (September 1985), p. 10. 58. 1842 census of Clinton Tp., Lincoln Co. (PAC microfilm no. C-1344); unpaginated. 59. 1852 census of Lincoln Co. (PAC microfilm no. C-11736), Clinton Tp., fo. 89. 60. Annals of the Forty, 2nd ed., 4:55. 61. This transcript was made by the industrious Corlene Taylor, of the Niagara Branch OGS, who kindly furnished a copy. 62. Annals of the Forty, 8:62. 63. Our account of him comes almost entirely from Lisa J. Schureman. 64. Annals of the Forty, 4:50. 65. Illustrated Historical Atlas of the counties of Lincoln and Welland, Ontario (Toronto: H.R. Page, 1876). 66. 1881 Census of Canada, Ontario, Lincoln Co., Clinton Tp., district 145, sub-district D, division 1, p. 14; PAC microfilm no. C-13255 [Family History Library microfilm no. 1,375,891. 67. 1881 Census of Canada, Ontario, Lincoln Co., Clinton Tp., district 145, sub-district D, division 1, p. 18; PAC microfilm no. C-13255 [Family History Library microfilm no. 1,375,891. 68. Lincoln County marriage registrations, no. 5932-76. 69. Lincoln County, Ontario, marriage registrations, no. 4963-74. 70. Lincoln County death registrations, no. 018877. 71. Lincoln County death registrations, no. 015566. 72. 1881 Census of Canada, Ontario, Lincoln Co., Clinton Tp., district 145, sub-district D, division 1, p. 14; PAC microfilm no. C-13255 [Family History Library microfilm no. 1,375,891. 74. Lincoln County death registrations, no. 019788. 78. Talbot District Marriage Register, 1838-1857. 80. Annals of the Forty, 9:22. 81. Annals of the Forty, 1:75. 82. Some dates here were supplied by Susan (Rutherford) Bijakowski, whose husband is a descedant. 83. 1880 U.S. Federal Census, Michigan, Huron Co., White Rock, p. 214C; National Archives microfilm no. 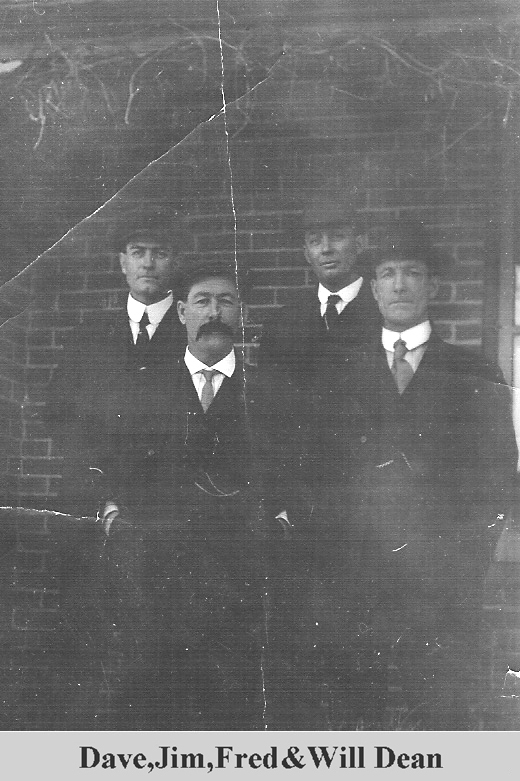 T9-0582 [Family History Library microfilm no. 1,254,582]. 85. Annals of the Forty, 2nd ed., 6:43 (we have not seen the first ed. of vol. 6). 86. Annals of the Forty, 1:75, 73. 87. Ontario Genealogical Society, Niagara Peninsula Branch, 1828 Census [of] Welland County… (September 1985), p. 10. 88. Thomas B. Wilson, Marriage Bonds of Ontario, 1803-1834 (Lambertville, N.J.: Hunterdon House, 1985), p. 239. 89. 1842 census of Clinton Tp., Lincoln Co. (PAC microfilm no. C-1344); unpaginated. 90. Norfolk County death registrations, unnumbered. Entire family "A. Presb." (sic) in religion. 92. 1881 Census of Canada, Ontario, Norfolk South, Charlotteville, district 157, sub-district C, division 2, p. 28; PAC microfilm no. C-13262 [Family History Library microfilm no. 1,375,898]. 93. This family is represented incorrectly in DGT, p. 24, where the daughter Mary is erroneously called Sarah, and the daughter Rachael is erroneously called Mary. It would appear that the Bottings, in transcribing the evidence of the 1861 census, inadvertently duplicated the mother’s name of Sarah for the daughter Mary and moved Mary’s name down a row, eliminating the second daughter Rachael. 94. Lincoln County marriage registrations, 1876, no. 006045. 95. Essex County marriage registrations, no. 002593-79. 96. 1881 Census of Canada, Ontario, Lincoln Co., Grimsby Tp., district 145, sub-district E, division 2, p. 47; PAC microfilm no. C-13255 [Family History Library microfilm no. 1,375,891]. 97. Pre-1861 censuses and assessments of Erin Tp., various years, PAC microfilm no. M-7746. 98. Her surname is given as Breckman in the published transcription of the bible record of John Dean and Anna Mingle, reprinted at the end of these notes. However, it appears as Whitman in the 1882 marriage record of her son Emery Allen Dean. for the rest of the column. + An error for Emory. 101. Grey County marriage registrations, no. 002658. 102. 1901 Census of Canada, district 64 (Grey East), subdistrict E (Melancthon), division 4, p. 16; PAC microfilm no. T-6468. 103. 1881 Census of Canada, Ontario, Wellington South, Erin Tp., district 151, sub-district E, division 2, p. 50; PAC microfilm no. C-13258 [Family History Library microfilm no. 1,375,894. 104. 1901 Census of Canada, Ontario, district 126 (Wellington South), subdistrict B (Erin), division 5, p. 10; PAC microfilm no. T-6505. 105. Grey County marriages, 1880, no. 3196. 106. Alumni Record of Drew Theological Seminary, 1867-1905 (1906), pp. 302-303. We have expanded abbreviations, altered punctuation, and changed the order some of the elements of information. 107. Information from Carol Morrow. 111. Information from Carol Morrow. Declaration of Birth, Wayne Co, Michigan, no. 901253: Russell Stewart Dean, male, born 11 July 1881 Meaford, Grey Co, Ontario; son of Salem Adolphus Dean res. Shelburne, Ont, Methodist minister of Shelburne and Mina Raymond; Dr. McLean; informant the mother, Mina Raymond Dean, of 1530 Garland Av, Detroit, Wayne County, Michigan; dated 21 May 1930. (signed) Mina Raymond Dean. 113. Information from Carol Morrow. 116. Information from Carol Morrow. Russell S. (Elizabeth) Dean, trav. salesman, boards 309 Stark. Russell S. (Eliz & Sue) Dean, USA, residence 309 Stark. accountant/ soldier ______, on wages, living alone. accountant [for] state govt, govt wages. 119. Michigan death records, as indexed at FamilySearch. 120. Information from Carol Morrow, from Michigan, Births and Christenings Index: Jennie Pearl Dean, female, born 15 July 1883 Stockbridge, Livingston, Michigan; d/o Salem Adolphus Dean and Mina Raymond Dean [FHL microfilm no. 1,005,440]. 123. Archives of Ontario, Lincoln County Surrogate Court Wills, file no. 1261, indexed in Surrogate Court Index of Ontario, Canada, 1859-1900 — Volume 5, Lincoln and Welland Counties (Agincourt, Ontario: Generation Press, 1988); not personally seen. 124. DGT, pp. 25-26 contains an appendix giving an account of this mill which appeared in the St. Catharines Standard of 1 September 1948. 125. 1881 Census of Canada, Ontario, Lincoln Co., Clinton Tp., district 145, sub-district D, division 2, p. 32; PAC microfilm no. C-13255 [Family History Library microfilm no. 1,375,891]. 126. 1901 Census of Ontario, district no. 85 (Lincoln & Niagara), subdistrict b-2 (Clinton), division b-2, p. 7; PAC microfilm no. T-6479. 127. 1881 Census of Canada, Ontario, Lincoln Co., Clinton Tp., district 145, sub-district D, division 2, p. 32; PAC microfilm no. C-13255 [Family History Library microfilm no. 1,375,891]. 128. Lincoln County, Ontario, marriage registrations, no. 4797-74. 129. Lincoln County Marriage registrations, no. 006703-85. 130. Lincoln County Marriage registrations, no. 006706-85 . 132. Marriage date and wife’s birthdate and parentage from Larry Stitt’s Home Page, available online at http://publish.uwo.ca/~lstitt/. 133. Lincoln County, Ontario, marriage registrations, no. 9975-99. 134. Cecelia C. and Roland B. Botting, Comfort Families of America: A Collection of Genealogical Data (Brookings, South Dakota: the authors, 1971), p. 110. 136. Her husband is erroneously called James H. Smith in DGT, p. 19. 137. The date of his first marriage, which produced three children. 138. Lincoln County marriage registrations, no. 7611-96. 139. Lincoln County, Ontario, marriage registrations, no. 9266-98. 142. Straffordville Cemetery, Bayham Township, Elgin County, Ontario, Canada, available online at http://www.elginogs.ca/cemeteries/bayham/straffordville.htm. 143. The Marriage Registers of Upper Canada/Canada West, volume 2: Brock District Marriage Register, 1839-1850, compiled by Dan Walker & Fawne Stratford-Devai (Campbellville, Ontario: Global Heritage Press, 2000), p. 11. 144. Although the editors of the record place a question mark after “58 years,” the figure is in good agreement with the ages reported for her in census records: 30 in 1852, 39 in 1861, 49 in 1871, 60 in 1881. 145. 1852 Census of Canada, Ontario, Oxford Co., Zorra Tp. East, p. 62; PAC microfilm no. C-11744 [Family History Library microfilm no. 349,231], transcribed by Marg Hutton & Mary Crandall for OntarioGenWeb, available online at http://www.census-sense.com/ogw/transcript.asp?id=2477. 146. “Pioneer Maple Grove,” in The Tweedsmuir book of Richmond and Community, Bayham Township, Elgin County, Ontario, digitized at http://www.elgin.ca/ElginCounty/CulturalServices/Archives/tweedsmuir/ bayham.html, where it is designated Bayham, vol. 1. 147. 1861 Census of Canada, Ontario, Elgin Co., Bayham Tp., District 4, p. 81; PAC microfilm no. C-1018. 148. 1871 Census of Canada, Ontario, Elgin Co., Bayham Tp., District 4, p. 40; PAC microfilm no. C-9900. 149. 1881 census of Canada, Ontario, Elgin East, Bayham Tp., district 163, sub-district H, division 3, p. 31; PAC microfilm no. C-13266 [Family History Library microfilm no. 1,375,902]. 152. Old Richmond Cemetery, Bayham Township, Elgin County, Ontario, Canada, Gravestone Inscriptions, transcribed by M.F. Doan et al., available online at http://www.elginogs.ca/cemeteries/bayham/oldrichmond.htm. 154. 1881 census of Canada, Ontario, Elgin East, Bayham Tp., district 163, sub-district H, division 2, p. 33; PAC microfilm no. C-13266 [Family History Library microfilm no. 1,375,902]. 155. Straffordville Cemetery, Bayham Township, Elgin County, Ontario, Canada, available online at http://www.elginogs.ca/cemeteries/bayham/straffordville.htm. 157. Straffordville Cemetery, Bayham Township, Elgin County, Ontario, Canada, available online at http://www.elginogs.ca/cemeteries/bayham/straffordville.htm. 159. “Pioneer Maple Grove,” in The Tweedsmuir book of Richmond and Community, Bayham Township, Elgin County, Ontario, as cited above. 160. St. Thomas Times Journal, 25 August 1949, p. 6, col. 5, quoted by the editors of the published transcription of Straffordville Cemetery, cited above. 161. 1881 census of Canada, Ontario, Elgin East, Bayham Tp., district 163, sub-district H, division 3, p. 31; PAC microfilm no. C-13266 [Family History Library microfilm no. 1,375,902]. 162. 1901 Census of Canada, Ontario, district 57 (Elgin East), subdistrict B (Bayham), division 6, p. 8; PAC microfilm no. T-6464. 163. Oxford County, Ontario, marriage registrations, no. 8339-77. 164. 1880 U.S. Federal Census, Michigan, Huron Co., White Rock, p. 214C; National Archives microfilm no. 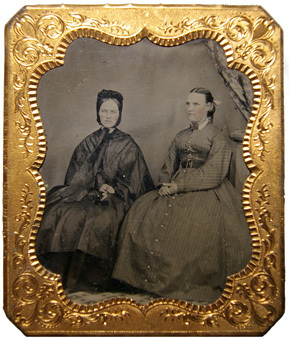 T9-0582 [Family History Library microfilm no. 1,254,582]. 165. 1881 Census of Canada, Ontario, Oxford South, Dereham Tp., district 165, sub-district A, division 4, p. 3; PAC microfilm no. C-13266 [Family History Library microfilm no. 1,375,902]. 166. 1901 Census of Canada, Ontario, district no. 58 (Elgin West), subdistrict A (Aldborough), division 5, p. 2; PAC microfilm no. T-6465. 167. 1900 U.S. Federal Census, Michigan, Tuscola County, Elmwood Township, Enumeration District 113, sheet 5A, microfilm no. T623_744. 168. 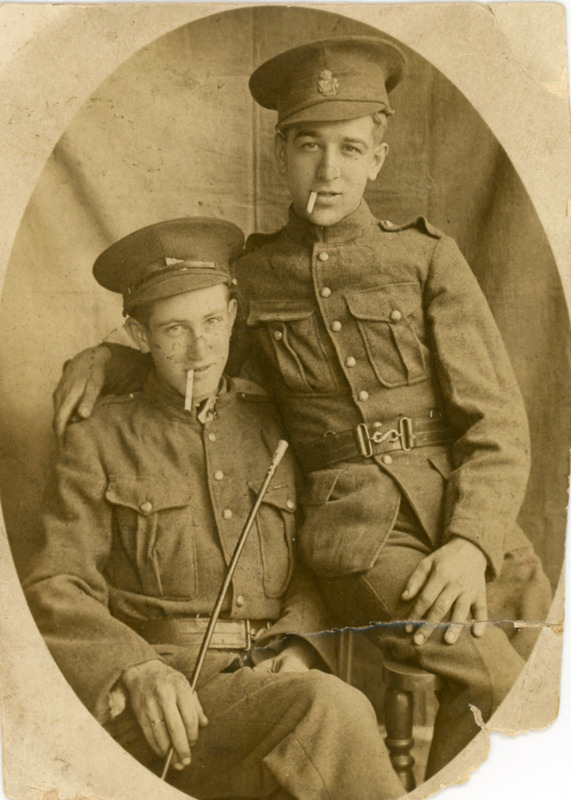 Soldiers of the First World War, at http://www.collectionscanada.gc.ca/databases/cef/001042-119.01-e.php (s.v. Ransome Henry Dean). 169. Border Crossings: From Canada to U.S., 1895-1954, database at Ancestry.com. 170. Information from Bonny Campbell, via Larry Dean. 171. Elgin County birth registrations, no. 1907-014804, giving the name of the mother as Anna May Greg; kindly brought to our attention by Bonny Campbell. 172. Adams Family Tree, at http://adams.familytreeguide.com/getperson.php?personID=I0410&tree=T1. 173. Elgin County marriage registrations, no. 2560-86. 174. Oxford County, Ontario, marriage registrations, no. 008932-86. 176. 1881 Census of Canada, Ontario, Welland Co., Willoughby Tp., district 142, sub-district G, p. 39; PAC microfilm no. C-13253 [Family History Library microfilm no. 1,375,889]. 177. 1901 census of Canada, Ontario, district no. 123 (Welland), subdistrict n (Willoughby Tp. ), division 2, p. 1; PAC microfilm no. T-6503. 178. Marriage notice, Welland Tribune & People’s Press, 19 October 1871, as extracted in The Ontario Register 7 (1983-84):147. 179. 1881 Census of Canada, Ontario, Welland Co., Willoughby Tp., district 142, sub-district G, p. 39; PAC microfilm no. C-13253 [Family History Library microfilm no. 1,375,889]. 180. 1901 Census of Canada, Ontario, district 67 (Haldimand & Monck), subdistrict N (Wainfleet), division 1, p. 6; PAC microfilm no. T-6470. 183. 1901 Census of Canada, Ontario, district no. 123 (Welland), subdistrict E (Fort Erie Village), p. 7; PAC microfilm no. T-6503. 184. British Columbia Death registrations, no. 1956-09-009384, in which his middle name is given as Armenus. 185. British Columbia Marriage registrations, no. 1895-09-116091. 186. British Columbia Death registrations, no. 1952-09-005774. 187. 1901 Census of Canada, British Columbia, district 3 (Vancouver Island), subdistrict h (Victoria North), division 4, p. 1; PAC microfilm T-6429. 188. British Columbia Birth registrations, no. 1896-09-386879, agreeing exactly with his date of birth as given in the 1901 census. 189. British Columbia Marriage registrations, no. 1922-09-245887. 190. Soldiers of the First World War database at http://www.collectionscanada.ca/02/020106_e.html, citing Regimental number 687614, RG 150, Box 2389-43. 191. British Columbia Marriage registrations, no. 1926-09-301106. 192. 1901 Census of Canada, British Columbia, district 3 (Vancouver Island), subdistrict h (Victoria North), division 4, p. 1; PAC microfilm T-6429. 195. 1881 census of Canada, Ontario, Lincoln Co., St. Catherines, district 145, sub-district A, division 1, p. 40; PAC microfilm no. C-13254 [Family History Library microfilm no. 1,375,890]. 196. 1881 Census of Canada, Ontario, Lincoln Co., Clinton Tp., district 145, sub-district D, division 2, p. 41; PAC microfilm no. C-13255 [Family History Library microfilm no. 1,375,891]. 198. The Rev. 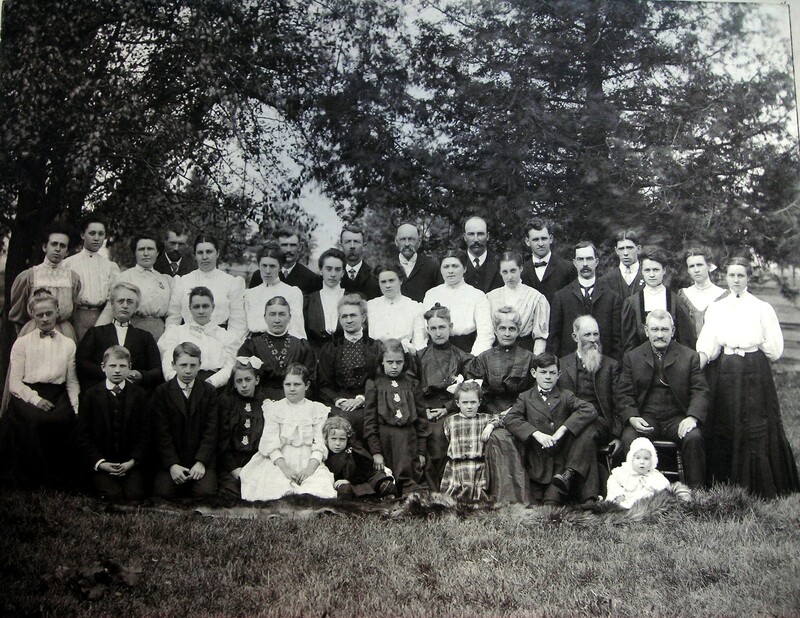 A. J. Fretz, A Genealogical Record of the Descendants of Christian and Hans Meyer and other Pioneers… (Harleysville, Pennsylvania, 1896), 430; Bill Martin, “Descendants of Adriaen Hendricks de Wees,” formerly available online at http://www.deweeses.com/Latest/. 199. 1881 Census of Canada, Ontario, Lincoln Co., Louth Tp., district 145, sub-district C, division 1, p. 37; PAC microfilm no. C-13254 [Family History Library microfilm no. 1,375,890]. 200. 1901 Census of Canada, Ontario, district 49 (Bruce North), subdistrict I (St. Edmunds), division 2, p. 5; PAC microfilm no. T-6461. 201. Marriage notices in Canadian Champion, 31 May 1900, p. 3, col. 4, and Burlington Gazette, 6 June 1900, p. 9, col. 2, abstracted in Halton’s Historical and Newspaper Records, at http://www.hhpl.on.ca/localhistory/. 202. Information from Mary Pitts, whose husband is a grandson. 203. 1901 Census of Canada, Ontario, district no. 68 (Halton), subdistrict g (Nelson Tp. ), division 2, p. 3; PAC microfilm no. T-6471. 205. Information from Mary Pitts. 207. Per 1901 census, which agrees exactly with his age at death as stated on his funeral card. The date of 24 June 1823 given in the family bible appears to be incorrect. 208. Ontario Marriage Index; family bible record. 209. For this family see Kim Nielsen, “Harley Family Tree,” available online at http://wc.rootsweb.com/cgi-bin/igm.cgi?db=:3084375. 210. 1881 Census of Canada, Ontario, Norfolk North, Windham Tp., district 158, sub-district C, division 1, p. 50; PAC microfilm number C-13263 [Family History Library microfilm no. 1,375,899]. 211. 1901 Census of Canada, Ontario, district 93 (Norfolk North), subdistrict G (Windham), division 3, p. 4; PAC microfilm no. T-6484. 212. Information from Gary Dean, of Thunder Bay, Ontario, and J. Frederick Dean, of Thunder Bay, both descendants. 213. Norfolk County marriage registrations, no. 1889-008093. The family bible record gives the impossible date of 29 February 1889. 214. Thunder Bay District marriage registrations, 1898, unnumbered. 215. Rainy River District birth registrations, 1899, unnumbered. 216. Algoma District birth registrations, 1901, unnumbered. 217. Rainy River District birth registrations, 1903, unnumbered. 218. Bruce County marriage registrations, 1898, unnumbered. Magaret Dean  wife   M   25   15 June 1875   Ont. Hazel Dean    dau. S    1   19 August 1901   Alberta W.
David Dean     head   M  40   .......   1871     .... C.N.R. Hazel Dean     dau. S  10   August    190..
221. 1901 Census of Canada, British Columbia, District no. 5 (Yale & Cariboo), Sub-District G (Revelstoke Riding), division 4, p. 14. The entry gives the date of his birth as 3 March 1878 (but the 8 is written over), his age as 23,his birthplace as Ontario, origin as English, nationality as Canadian, relgion as Presbyterian. 222. 1911 Census of Canada, Ontario, District no. 123 (Thunder Bay and Rainy River), Sub-District no. 26 (Fort William), Enumeration District no. 5 (City of Fort William), p. 4. 223. Per his own family bible record (see Bible Record no. 3, below) and the 1901 census. 224. Information from his great-grandson, Charles A. Dixon, who was present at the death. 225. Gray County marriage registrations, 1882, no. 003680, found by Charles A. Dixon; also contemporary certificate of the marriage in possession of Allan Dean. 226. 1901 Census of Canada, district 66 (Grey South), subdistrict C (Durham), division 1, p. 5; PAC microfilm no. T-6469. 227. Emery Allen Dean family bible record (see Bible Record no. 3, below, and information from their grandson, Allan Dean, and great-grandson, Charles A. Dixon. 228. York County marriage registrations, 1909, no. 002520, found by Charles A. Dixon. 229. Contemporary notice for funeral of Charlotte Dean, in possession of Allan Dean. 230. All information from grandson, Charles A. Dixon. 231. Per birth record; the date is erroneously given as 13 September 1896 in the 1901 census. 232. Marriage notice, Welland Tribune & People’s Press, 19 October 1871, as extracted in The Ontario Register 7 (1983-84):147. 233. 1881 Census of Canada, Ontario, Welland Co., Bertie Tp., district 142, sub-district C, division 2, p. 74; PAC microfilm no. C-13253 [Family History Library microfilm no. 1,375,889]. 234. 1901 Census of Canada, Ontario, district 123 (Welland), subdistrict a (Bertie Tp. ), division 4, p. 5; PAC microfilm no. T-6503. 235. This, and all other data on David Dean, is taken from the database of Brian L. Hurdle, at http://www.start.ca/users/bhurdle/. 236. Welland County, Ontario, marriage registrations, no. 015805-99. 237. Welland County, Ontario, marriage registrations, no. 014864-98. 238. Welland County, Ontario, marriage registrations, no. 018874-04. 239. 1901 census of Canada, Ontario, district no. 123 (Welland), subdistrict n (Willoughby Tp. ), division 2, p. 1; PAC microfilm no. T-6503. 240. Welland County marriage registrations, 1903, no. 019260. 241. Welland County marriage registrations, 1912, no. 020703.